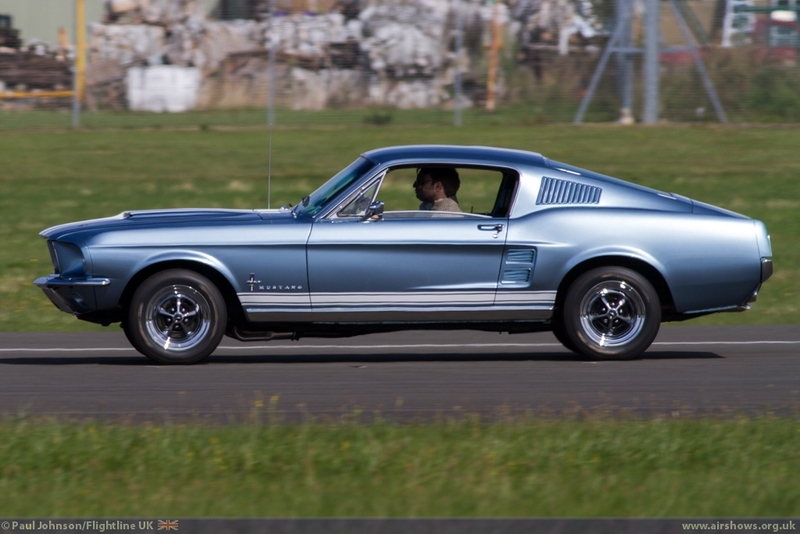 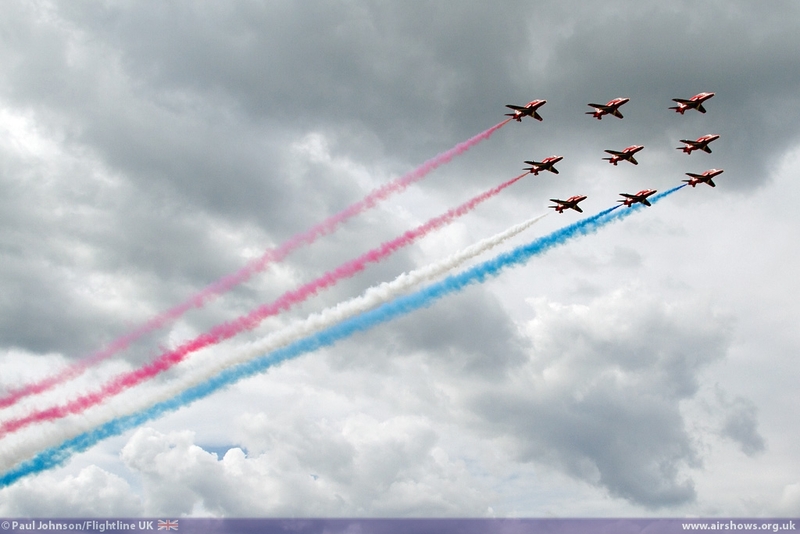 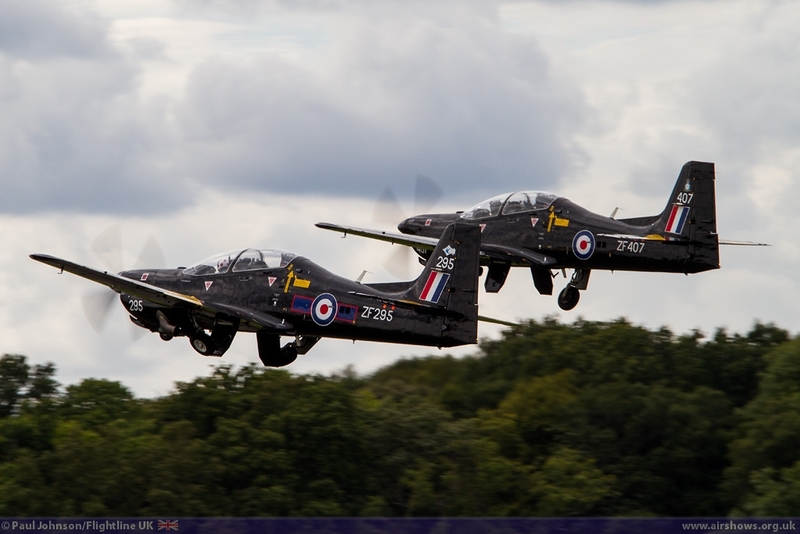 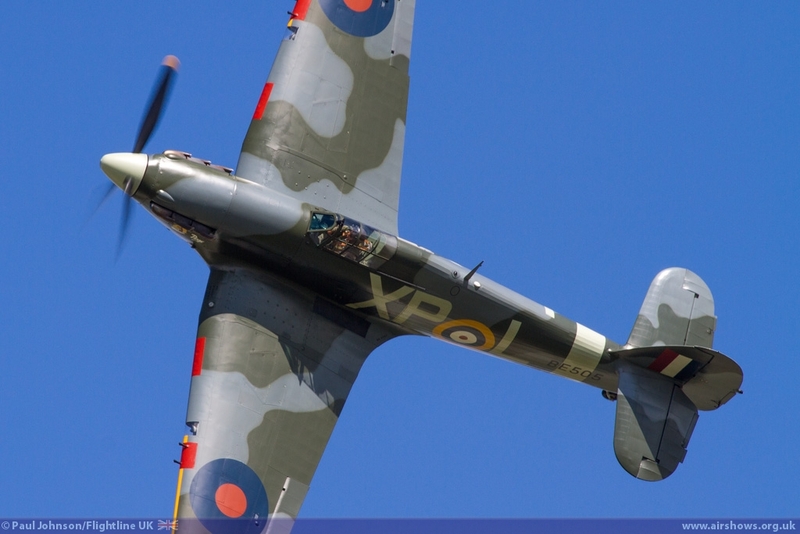 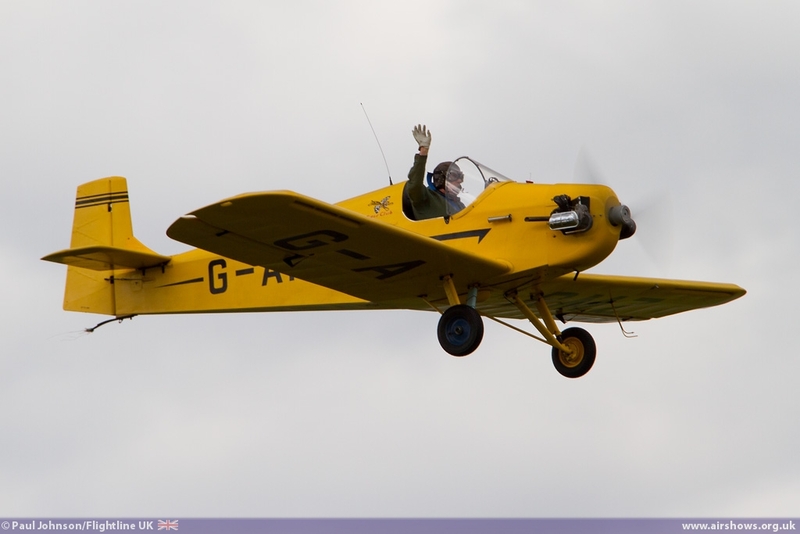 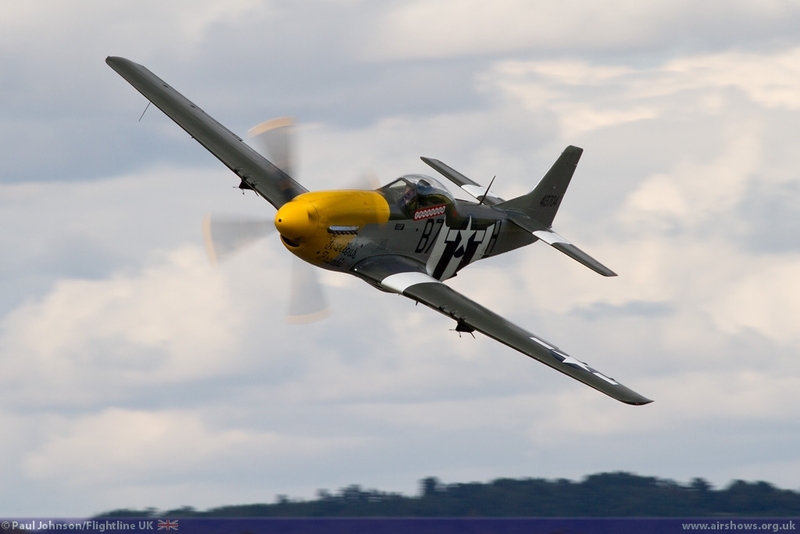 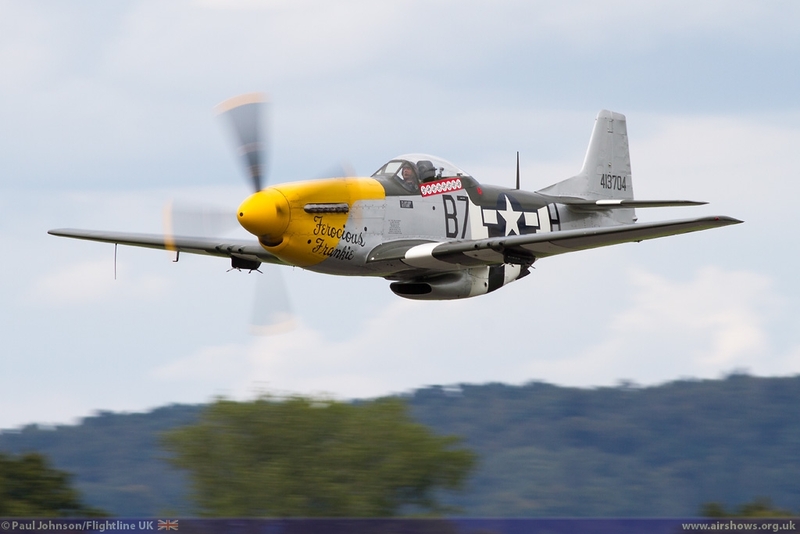 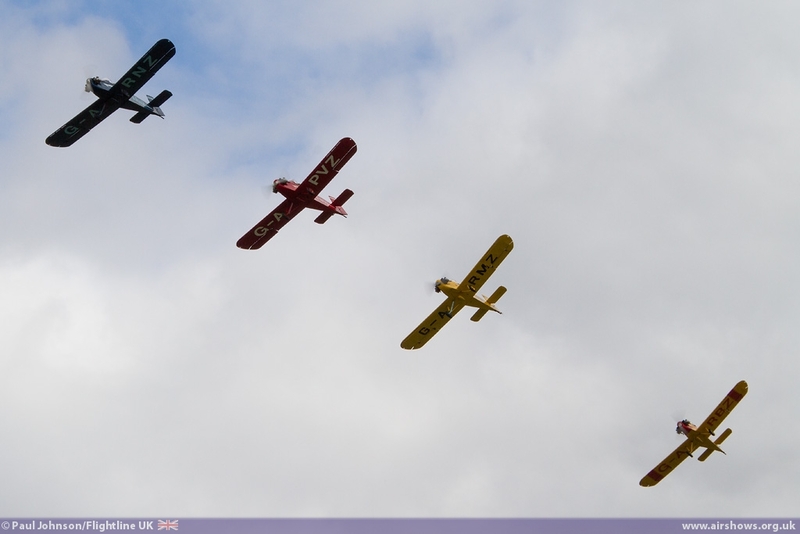 2014 sees the 10th Anniversary for Dunsfold Wings and Wheels. 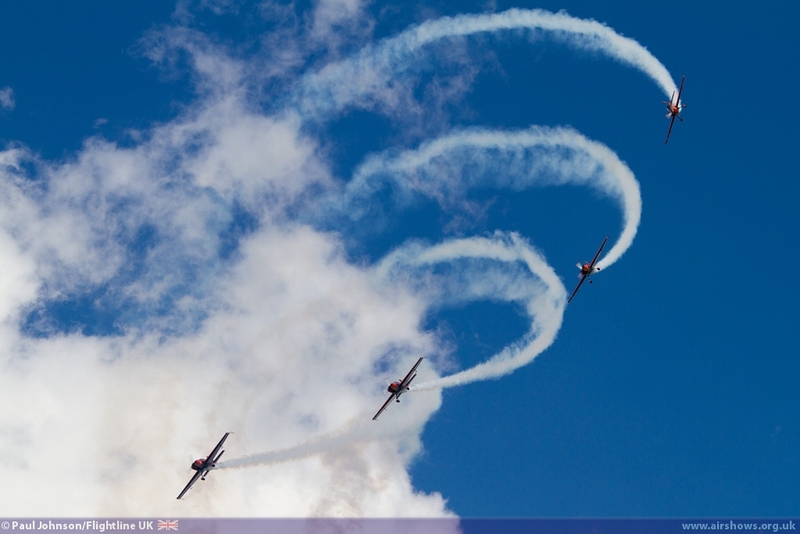 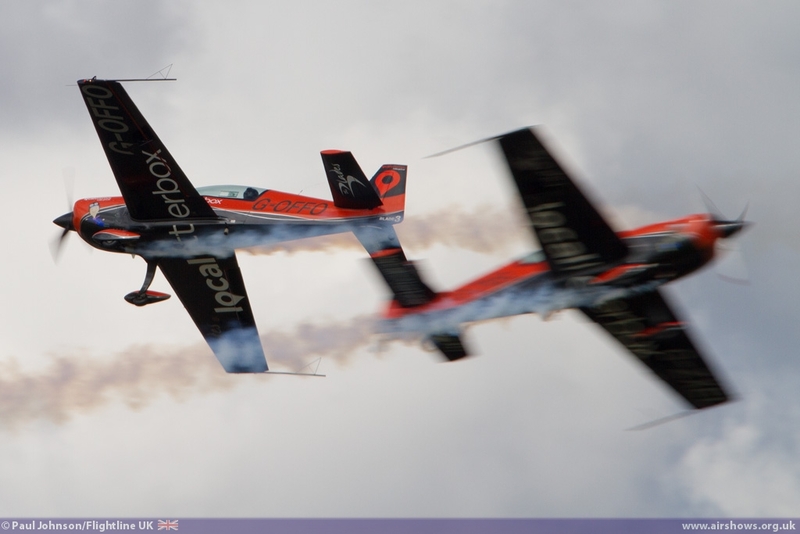 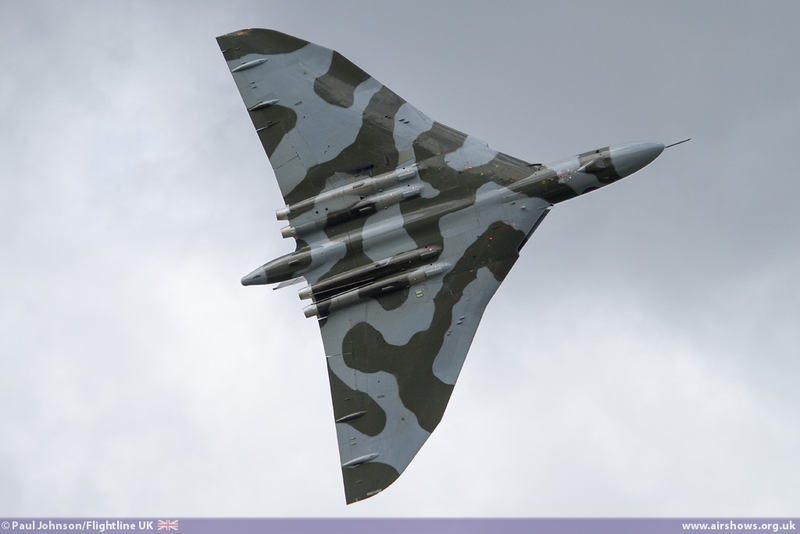 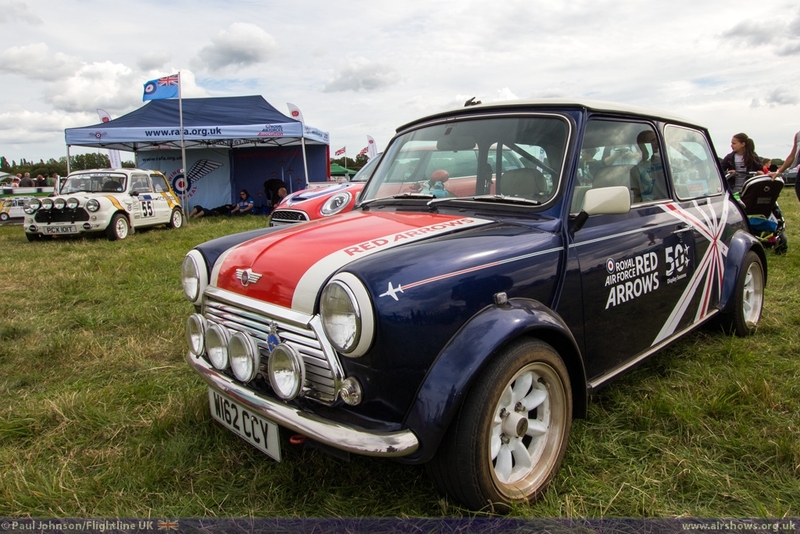 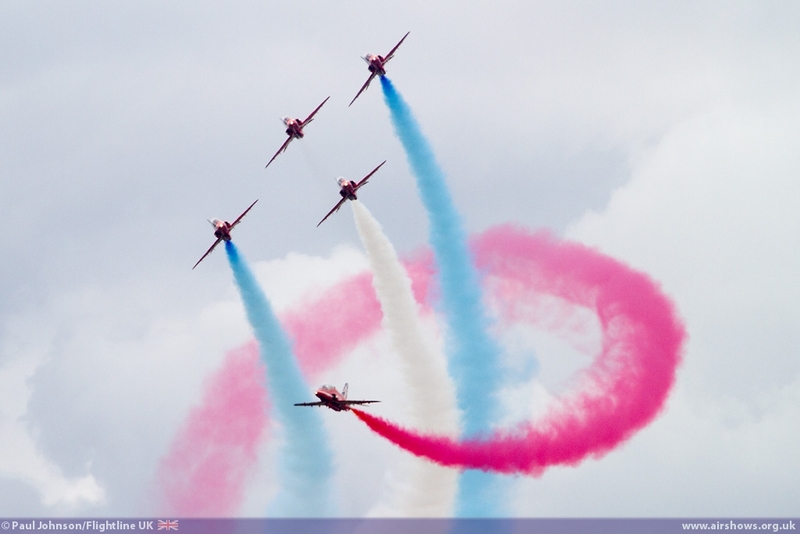 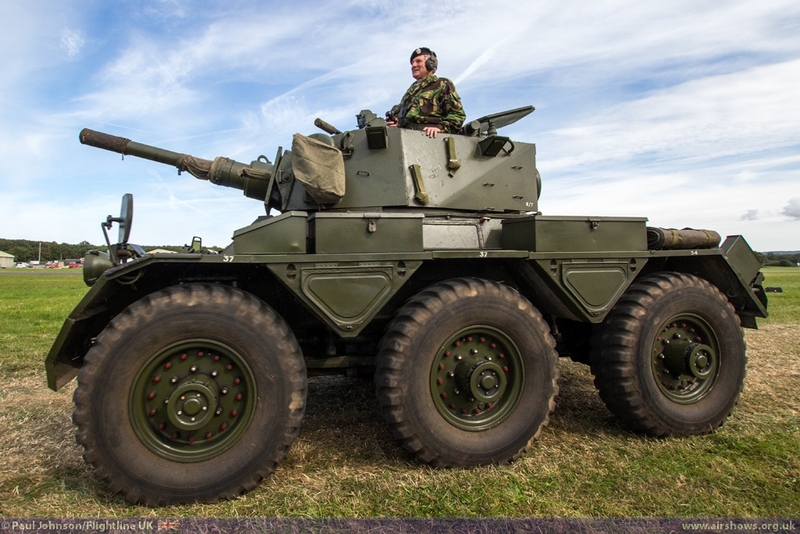 The show has grown into a major event on the UK airshow and historic motoring calendar and has also raised over £280,000 for national and local charities. 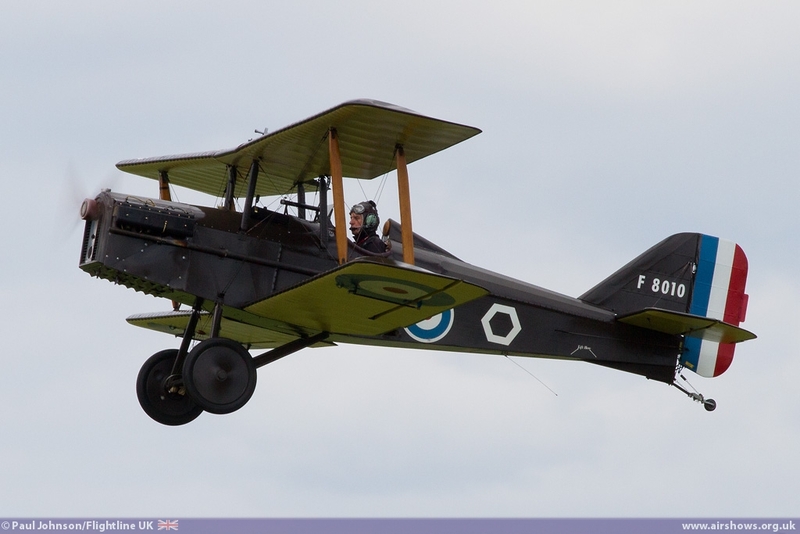 2014 proved to be a classic year for the event continuing its traditions of rare flypasts and some great flying in one of the friendliest atmospheres on the display circuit. 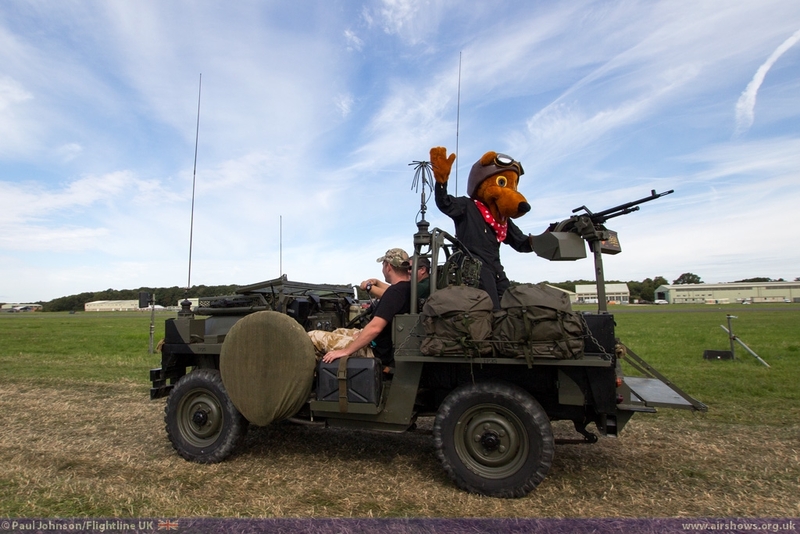 The events team at Dunsfold certainly deserved some better weather in 2014 and they certainly got it. 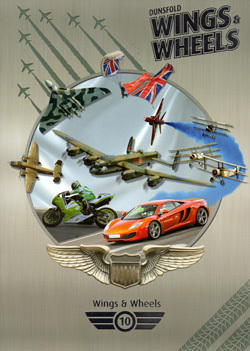 Wings and Wheels is a very different event on the calendar. 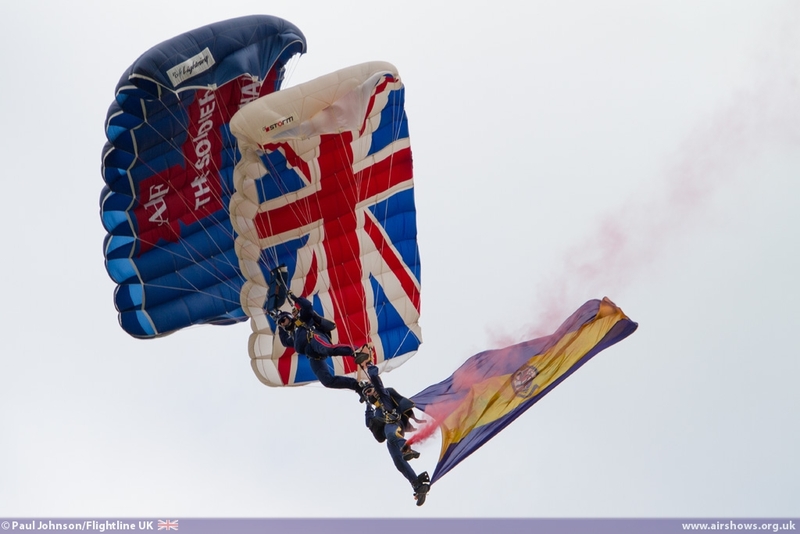 It is not only a very relaxed affair, but is also very varied. 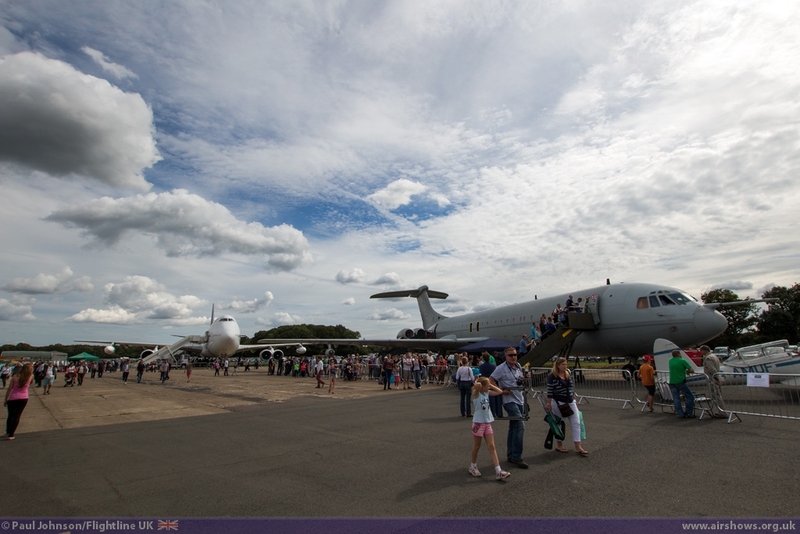 Certainly the huge collections of cars and military vehicles are big draws, but Dunsfold also makes good use of what it has on site with the addition of tours within the Boeing 747 from the James Bond film Casino Royale and the former RAF BAC VC-10 which was retired to the Surrey Airfield last year. 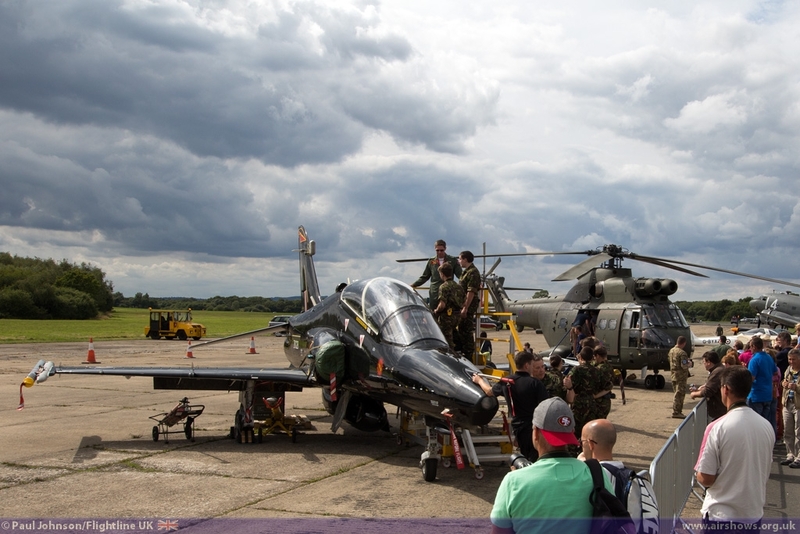 Following several difficult years, Dunsfold decided to move away from the traditional morning fly-in, but it still had an impressive static display with a RAF Puma HC2 and a Hawk T2 on static display amongst a number of other aircraft including Aces High's Mi-24 Hind plus resident examples of the Hunter and Sea Hawk. 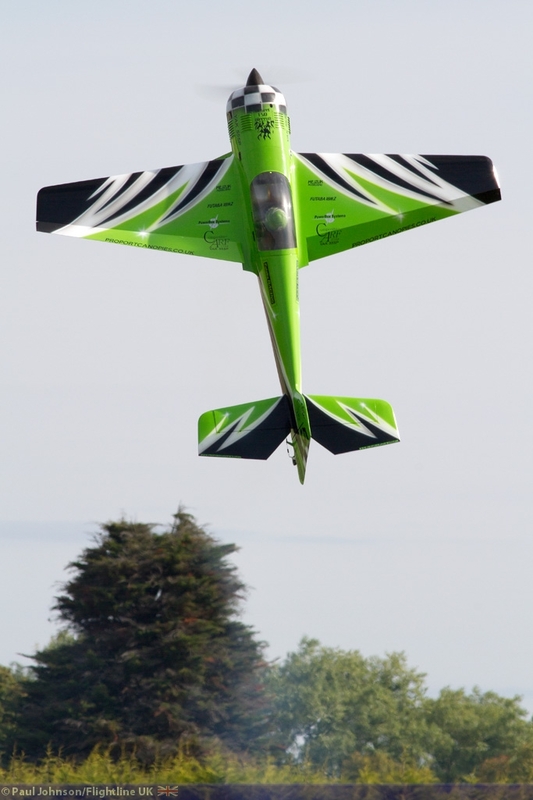 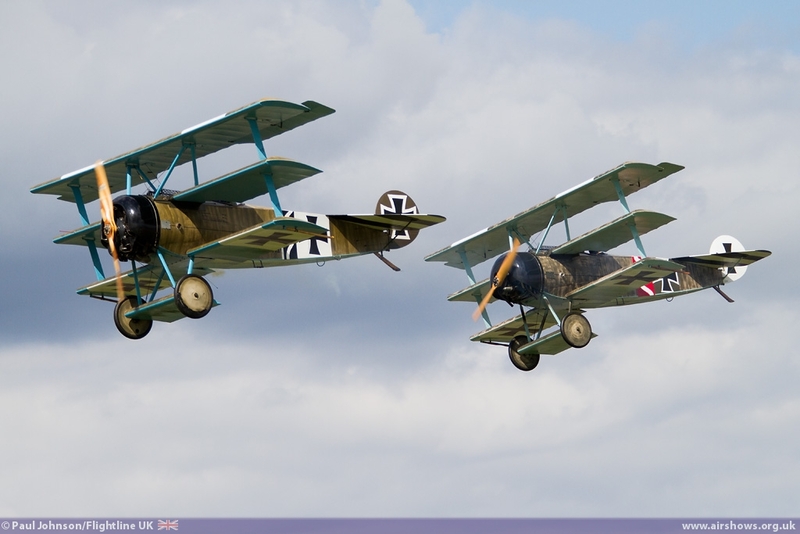 In addition to ful sized displays, Dunsfold put on an extended display of Radio Controlled model aircraft. 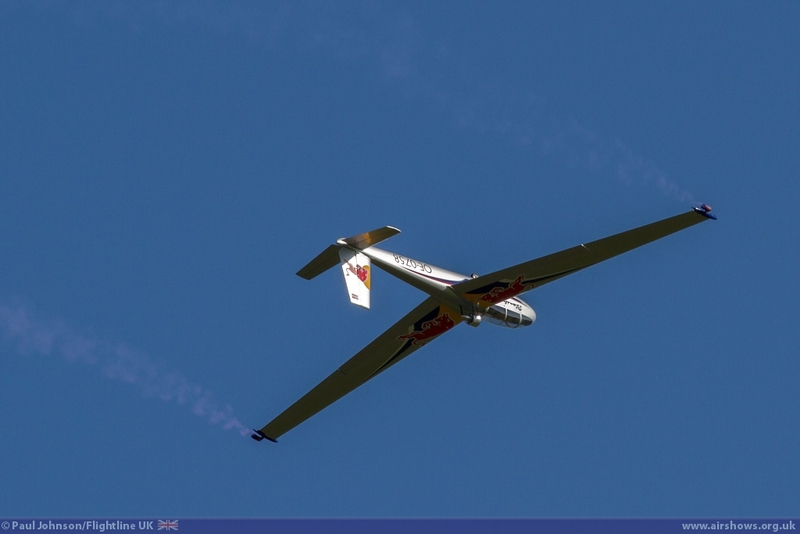 There was some great flying from a model Red Bull Blanix Glider, some rather rapid jet models and an amazing hovering Sukhoi like aircraft. 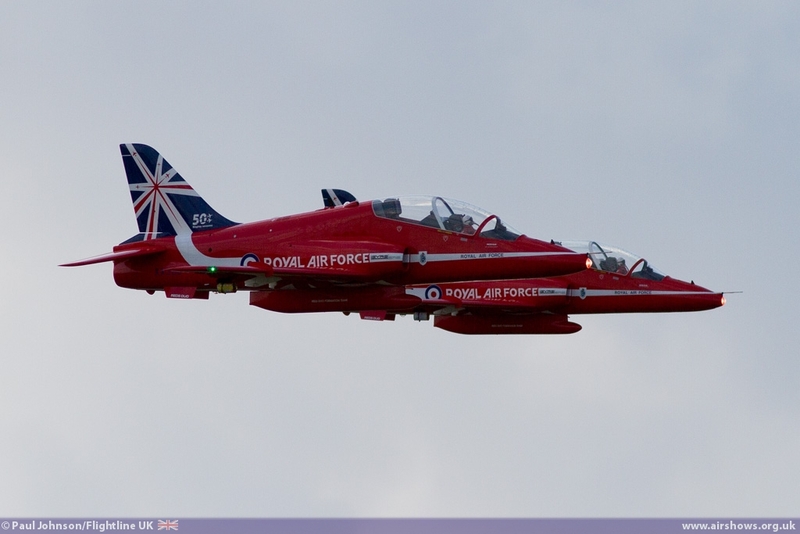 However, it was the returning Reds Duo that were the star attractions with their incredible formation display. 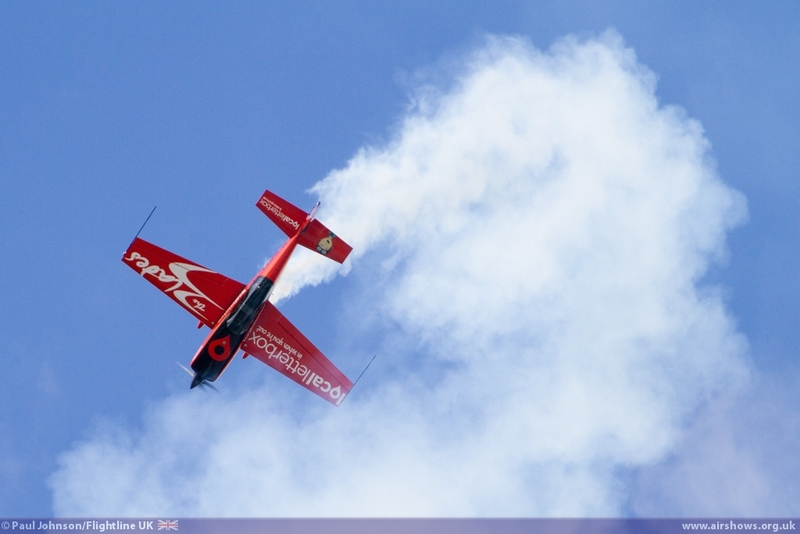 Few think R/C Models can entertain crowds at airshows, but the red Duo certainly can and it was great to see them back. 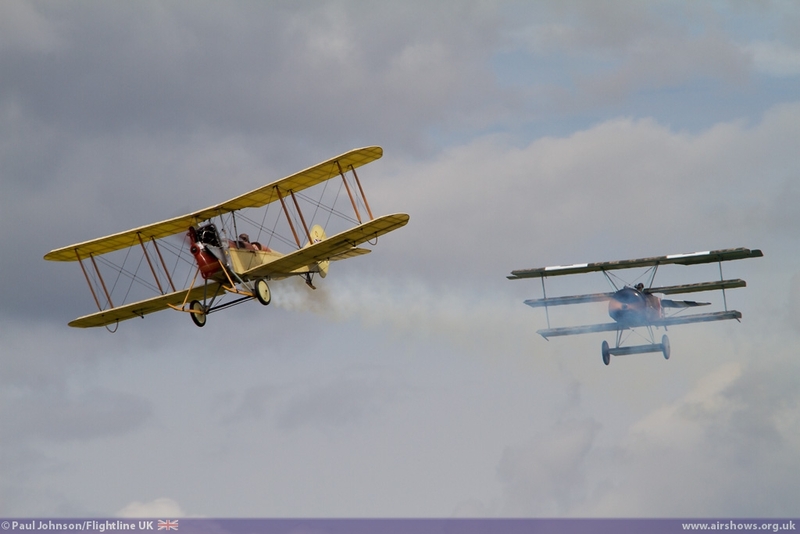 As always, the flying displays were split by motoring demonstrations along Dunsfold's runway. 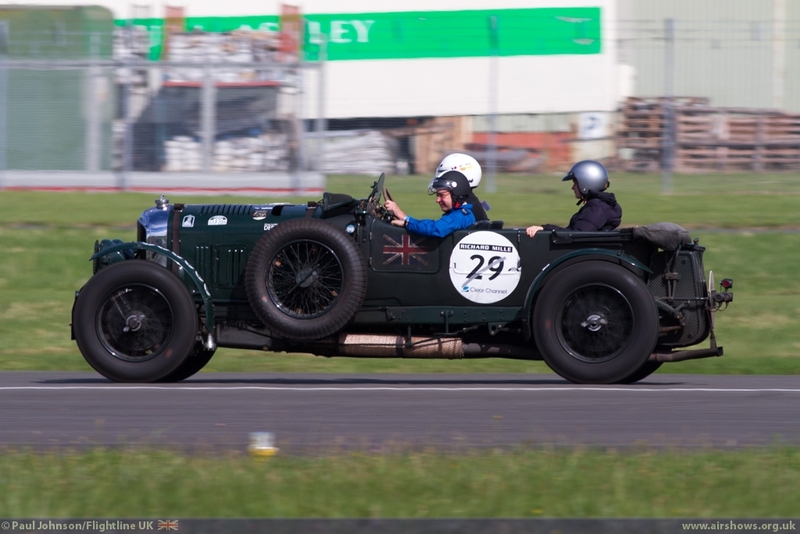 This is not only a reflection of the support of the show by Brooklands Museum, but also Dunsfold's modern automotive role. 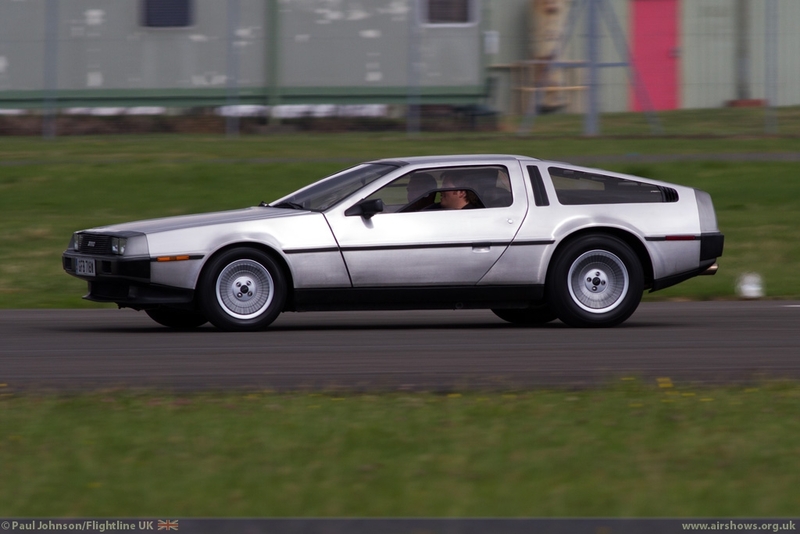 BBC's Top Gear still has its studios and test track at Dunsfold, but the airfield is often used as a test track by various motor racing schools and even Mclaren Cars to train drivers buying their new breed of Supercars. 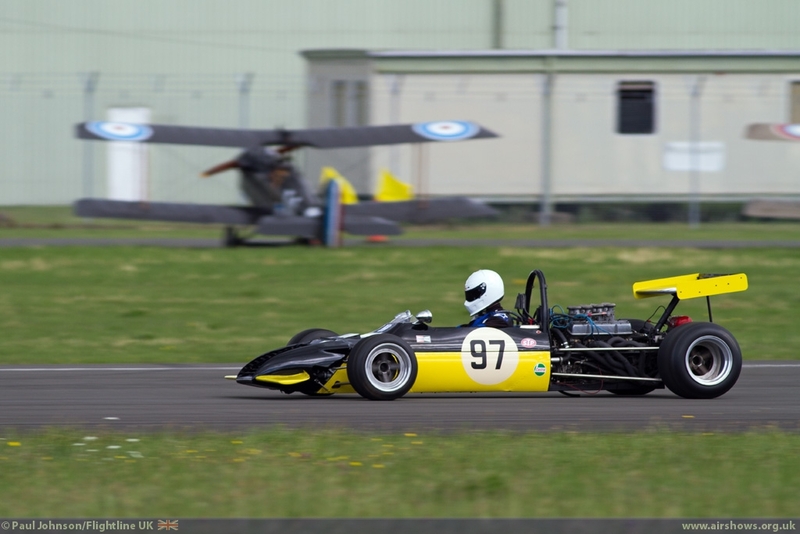 The range of vehicles running down the runway is always impressive with some very old motorbikes and sidecars to Formula 1 cars and the latest supercars. 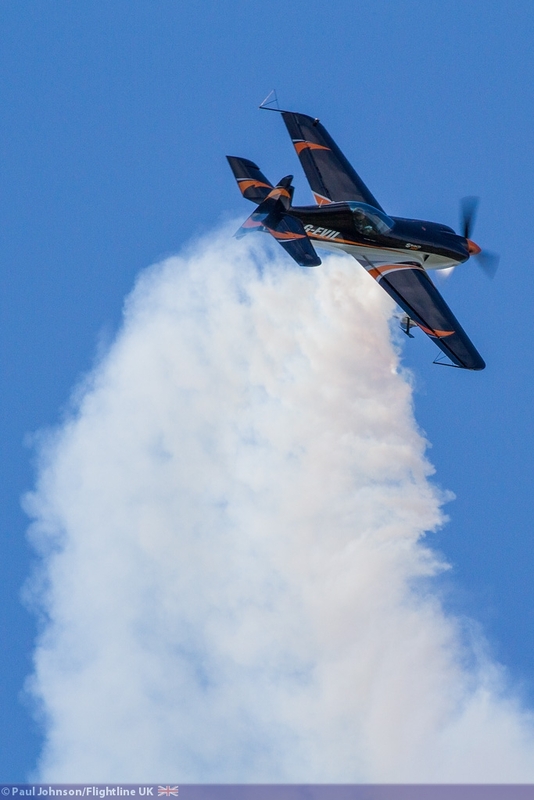 Since it began, the Wings and Wheels flying displays have always been themed around the aviation history of Dunsfold and Brooklands. 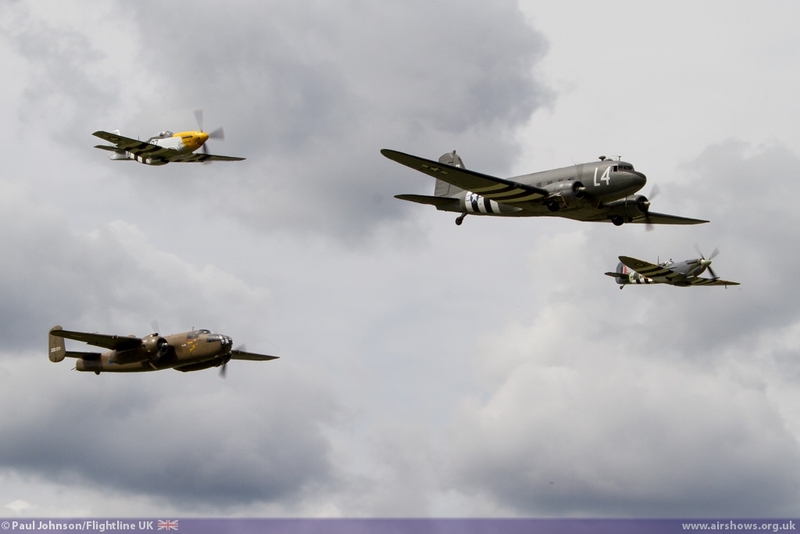 Dunsfold's wartime role came to the fore this year, particularly centring around the 70th Anniversary of the D-Day Landings. 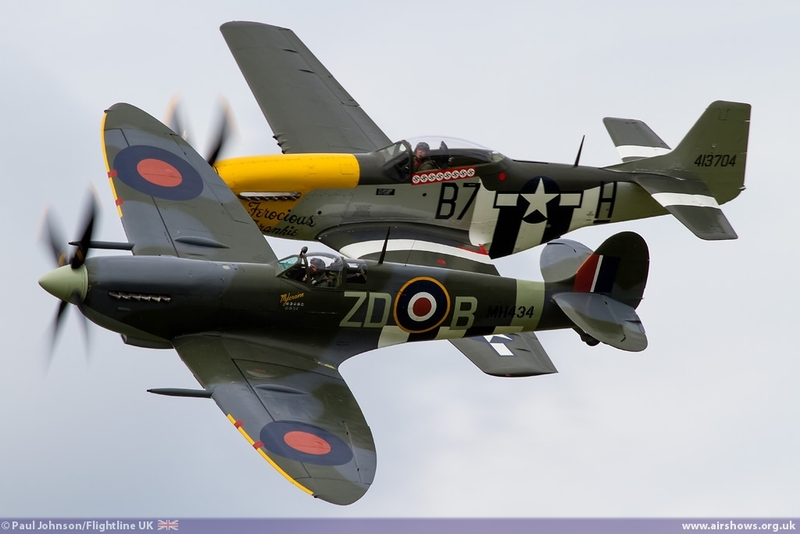 The Surrey airfield was a base for Royal Air Force, Royal Netherlands Air Force and Royal Canadian Air Force squadrons flying a variety aircraft including the B-25 Mitchell, P-51 Mustang and Supermarine Spitfire. 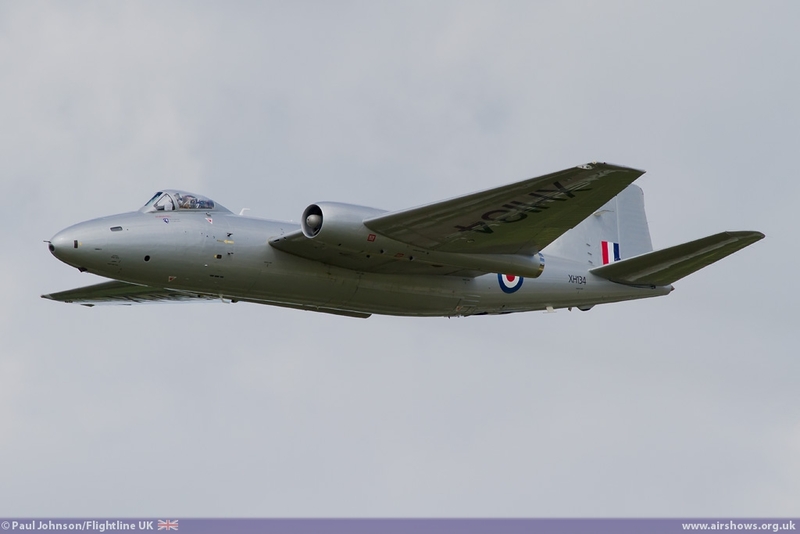 To mark the anniversary, Dunsfold not only put together a superb collection of warbirds to display throughout the afternoon, but surely one of the most memorable "balbos" of the year, at least on Sunday when everything clicked together! 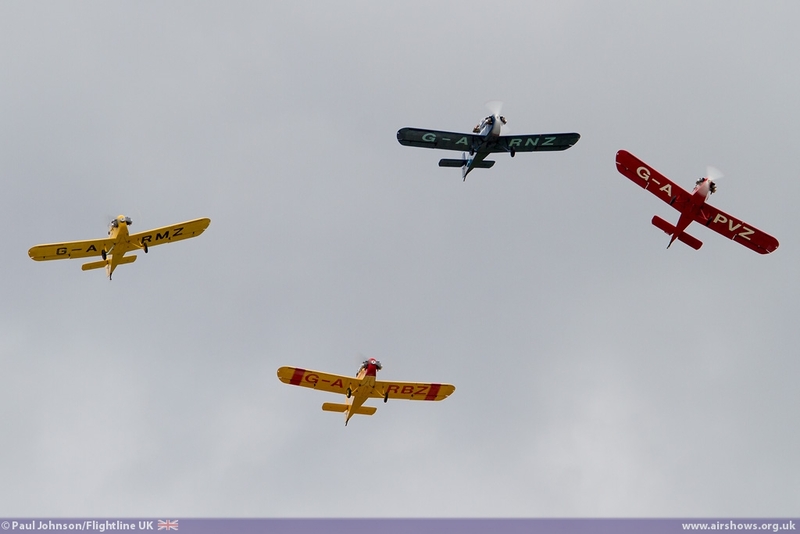 Leading the balbo was a "box" four of civilian owned warbirds which also performed their own solo displays during the day. 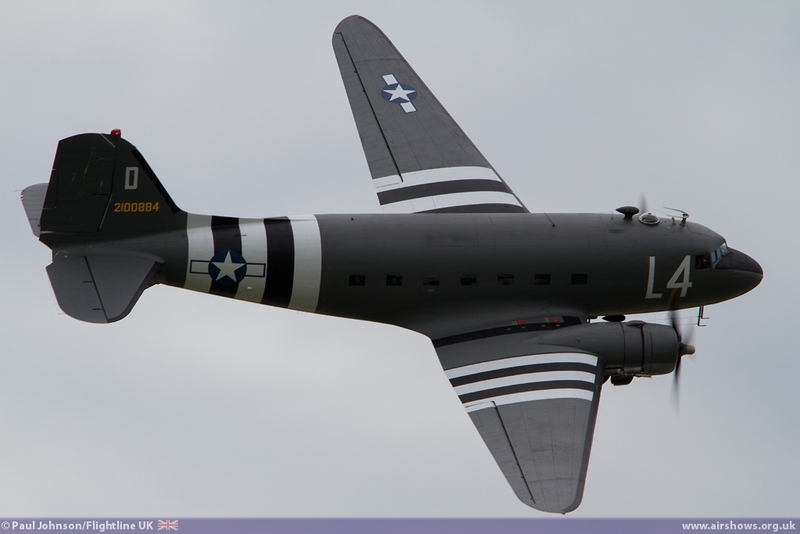 In the lead was the Dunsfold based Douglas C-47A Skytrain belonging to Aces High. 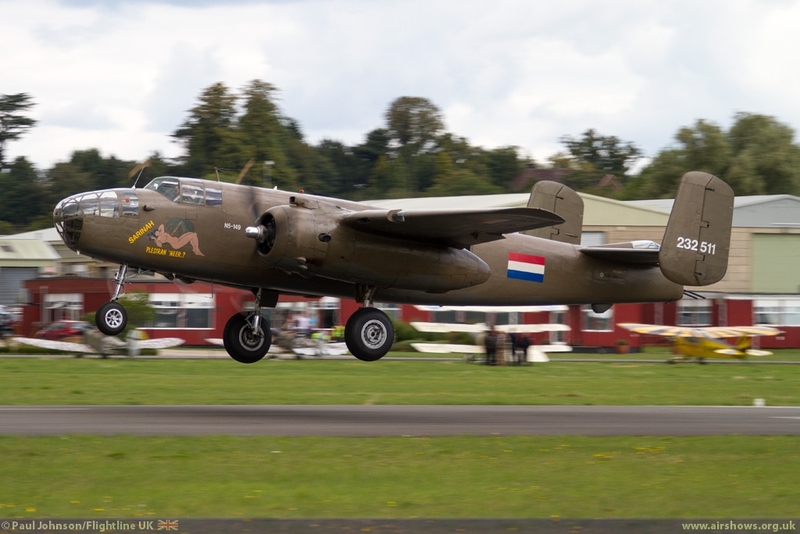 Behind was the Royal Netherlands Air Force Historic Flight North American B-25 Mitchell. 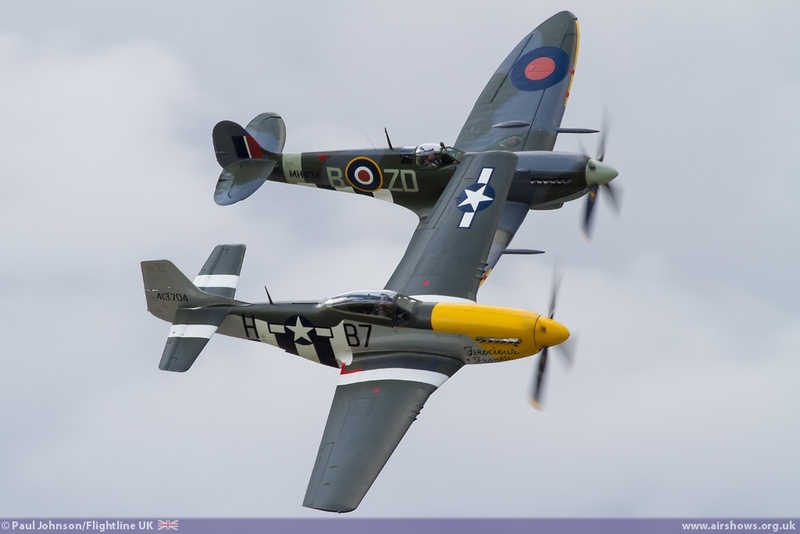 On each wing of the formation were the Old Flying Machine Company' pair of Supermarine Spitfire IX MH434 and North American P-51D Mustang Ferocious Frankie. 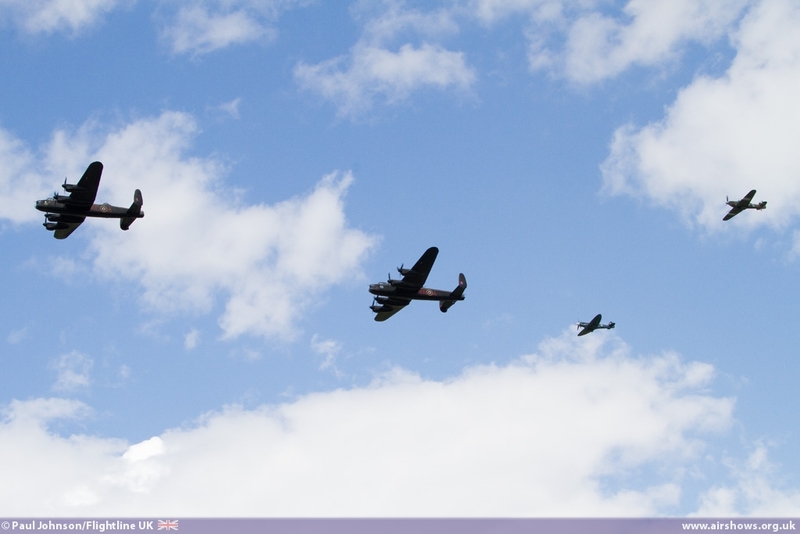 The following section were arguably the stars of the whole event this year, the Battle of Britain Memorial Flight with their Hawker Hurricane IIc, Supermarine Spitfire XIX, the Avro Lancaster B.Mk.1 joined by the Canadian Warplane Heritage Museum's Avro Lancaster B.Mk.X. 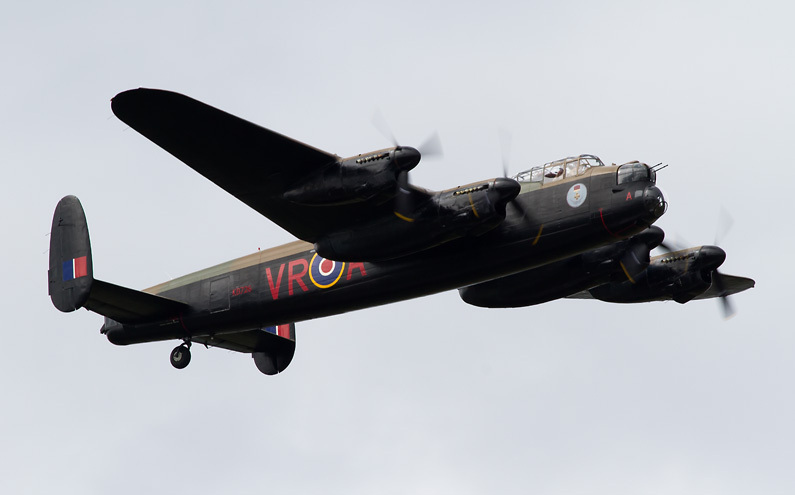 The sight and sound of two Lancasters flying together is certainly one you will never tire of, and it was great to see the Canadians flying over one of the many airfields that the Royal Canadian Air Force flew from during the Second World War. 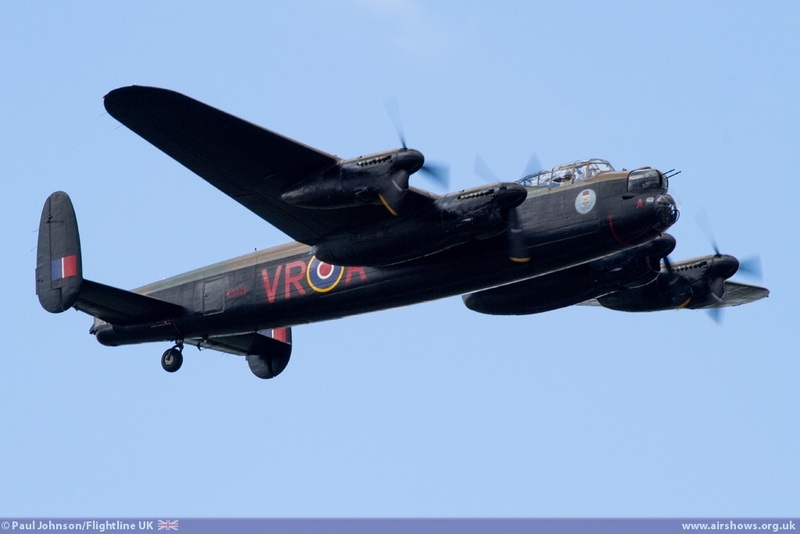 The Lancaster too has strong links to Dunsfold as many of the type flew into the airfield in the aftermath of the along with Dakotas repatriating Prisoners of War from Germany. 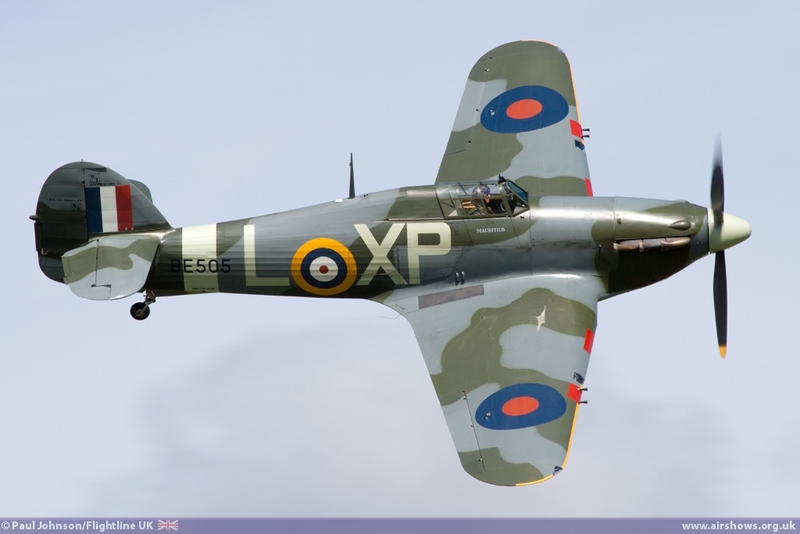 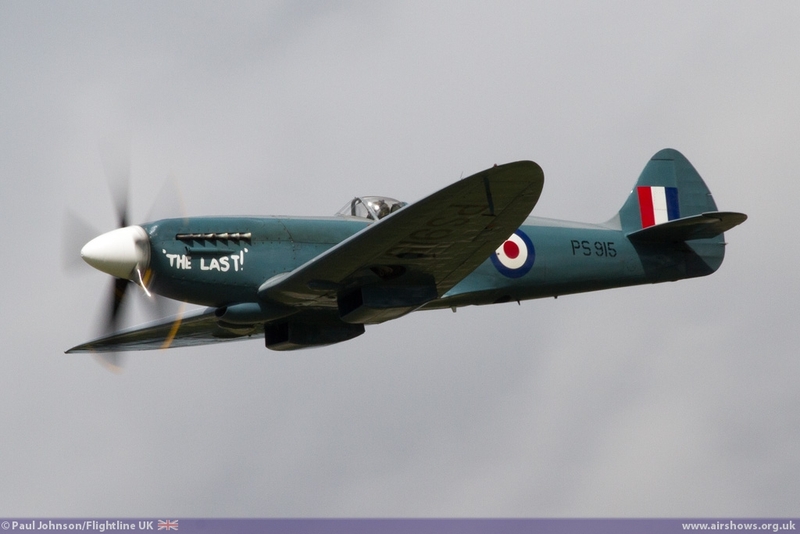 Spitfire and Hurricanes too share history with Dunsfold as Skyways Ltd refurbished the types for use by the Portuguese Air Force at the airfield. 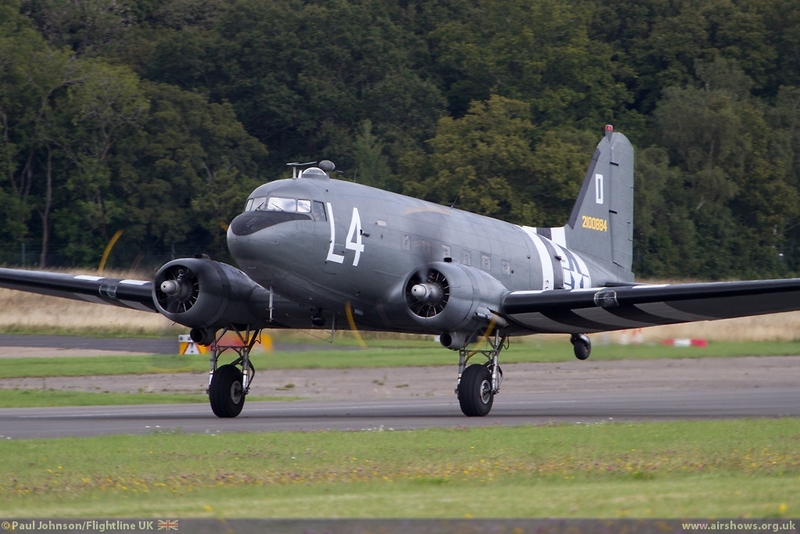 That company also played its part in the Berlin Airlift from Dunsfold. 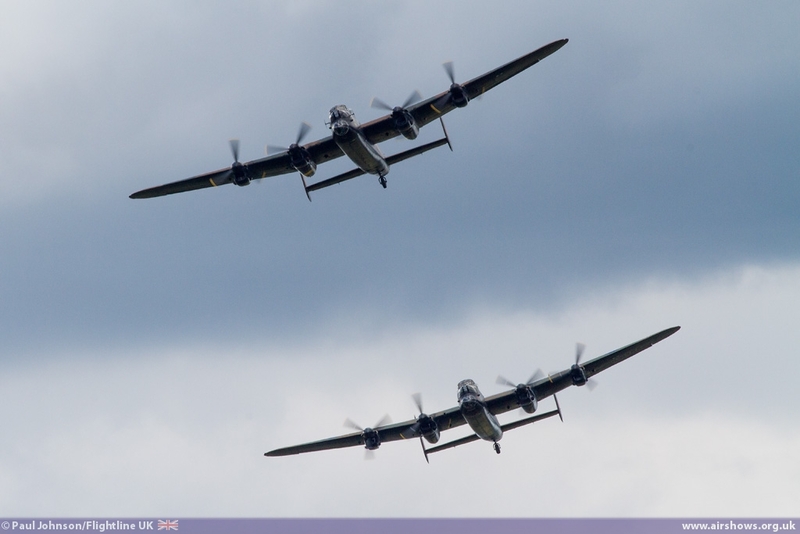 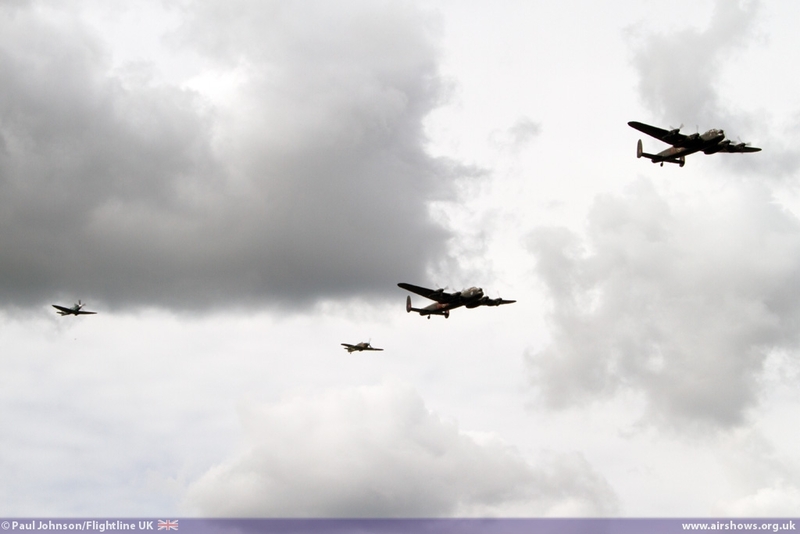 The Lancasters brought in massive crowds - for the first time ever Dunsfold "sold out" of tickets on the Sunday. 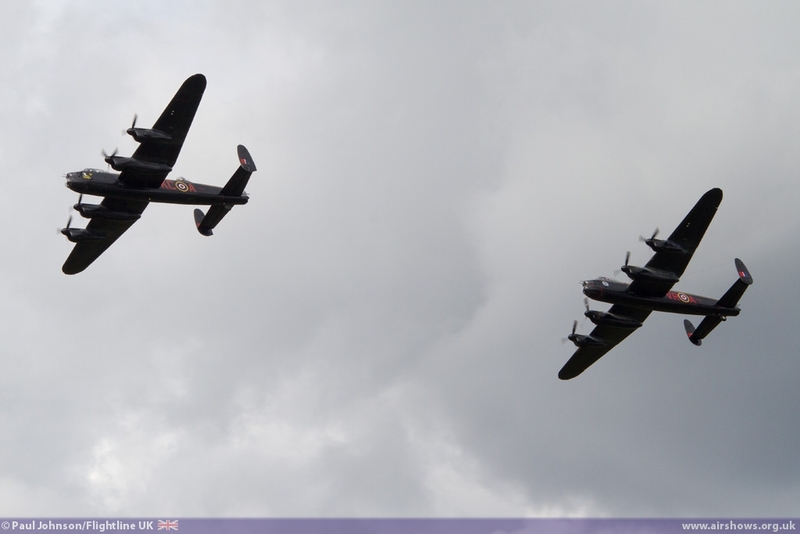 Their display was particularly emotive for the crowds who applauded the bombers on every pass they made. 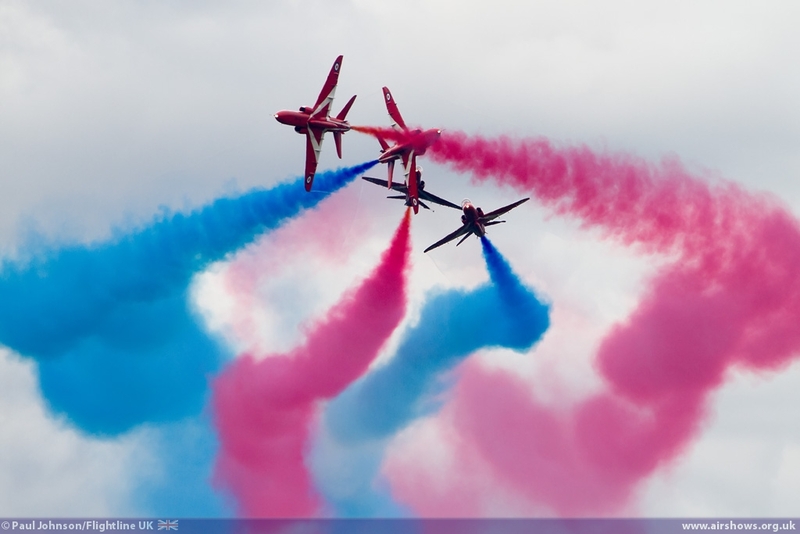 I've only ever experienced that at one other event which was the 2012 Bournemouth Air Festival when the Red Arrows returned following the tragedies the previous year. 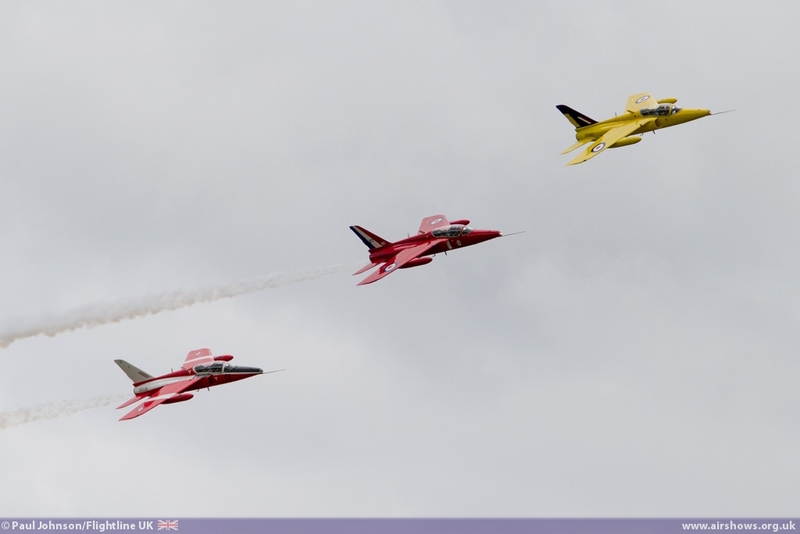 It is moments like these that really make the airshow season so special. 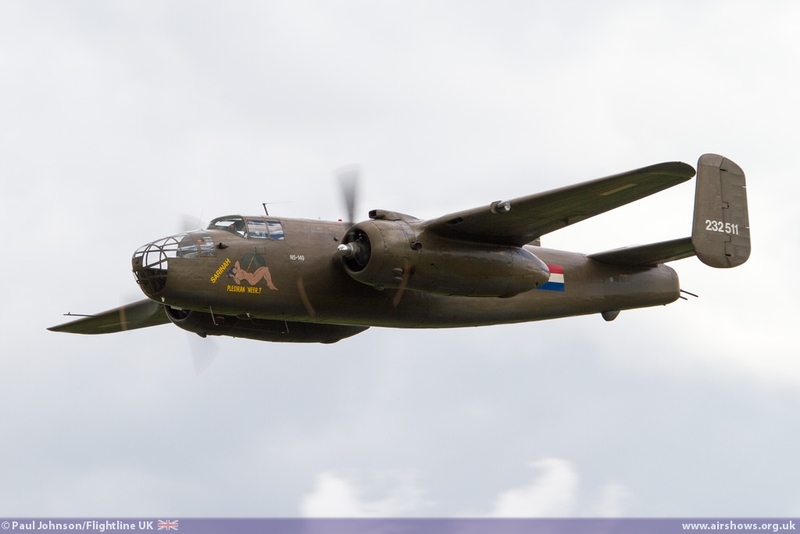 Mention must also be made of the OFMC Duo display. 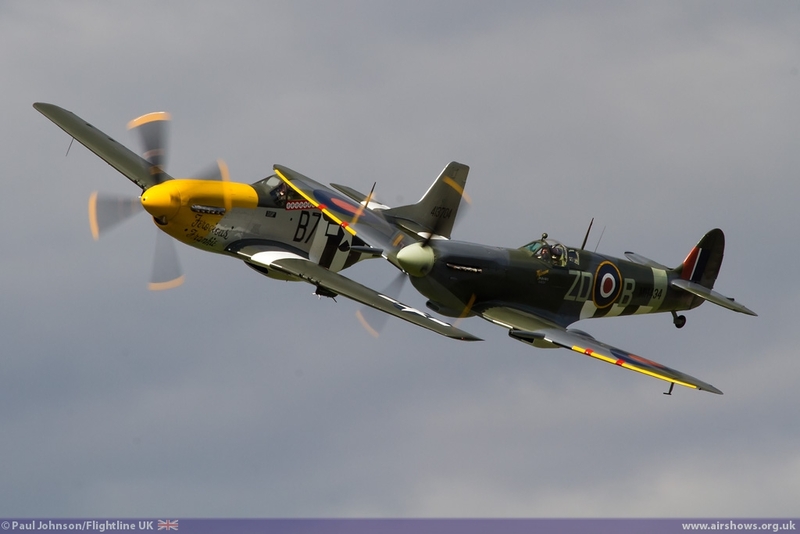 Alister Kay and Steve Jones put on a real master-class of tight formation flying in the Mustang and Spitfire which was certainly the best display of the weekend in the reviewers opinion! 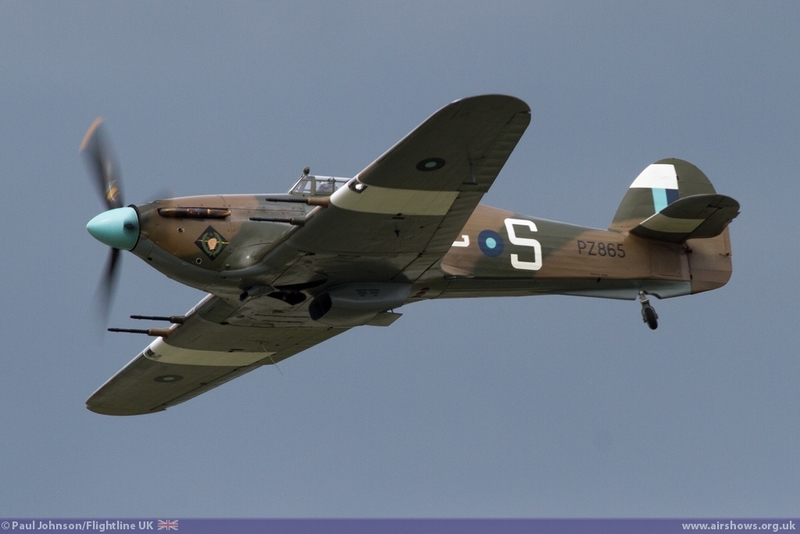 Further warbird action came from Peter Teichman flying his beautiful Hawker Hurricane IIb BE505. 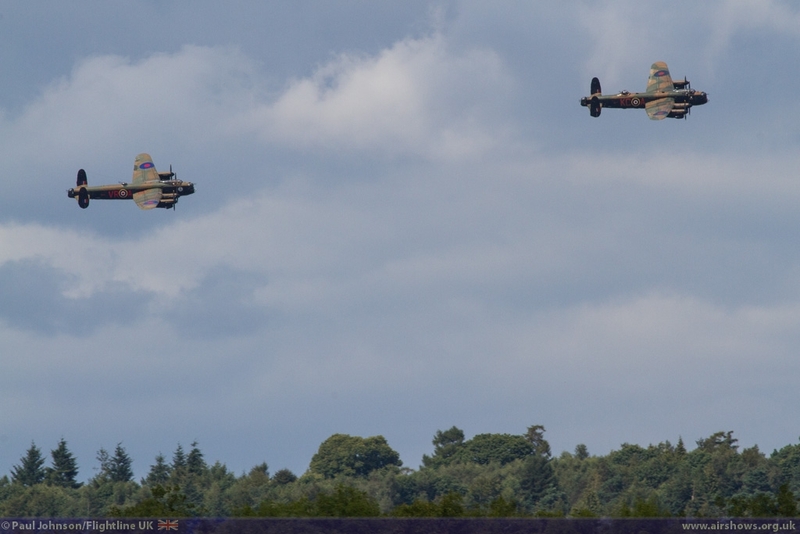 Hurricanes not only share links with Dunsfold, but also with Brooklands where the type made it first flight in 1935. 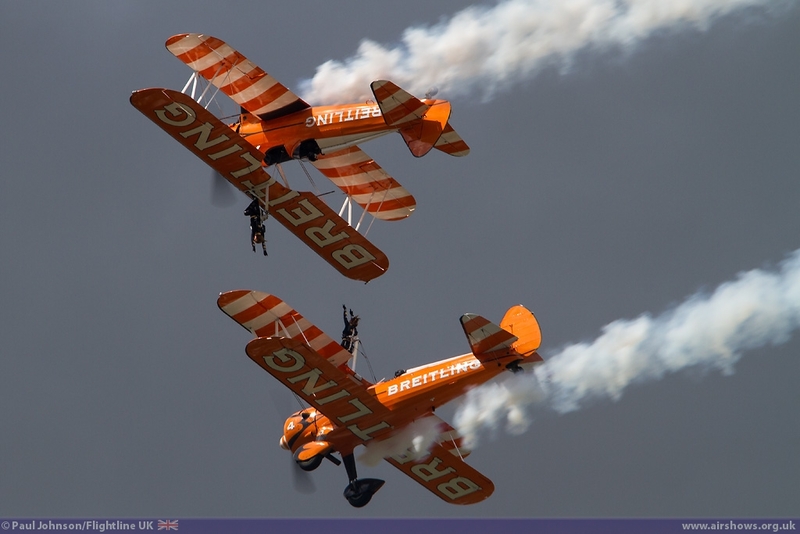 The line-up also featured several Dunsfold favourites including the Breitling Wingwalkers, the Tiger Club Turbulent Team and the Blades Aerobatic Team. 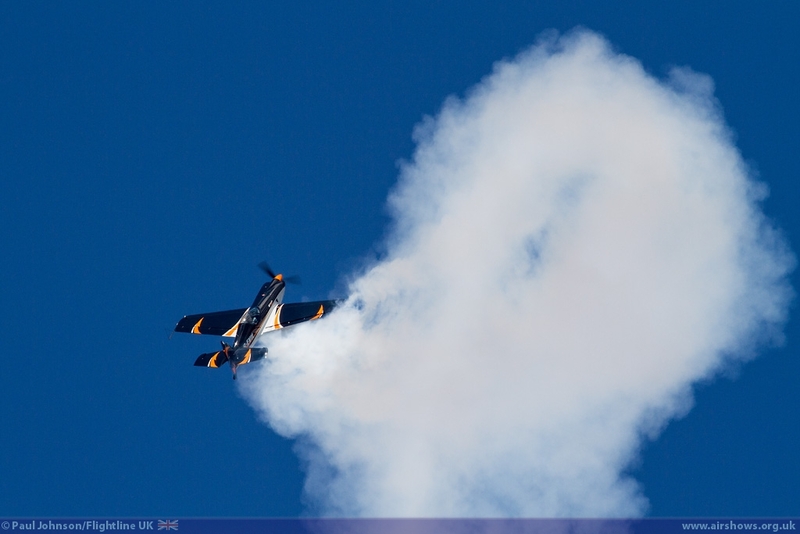 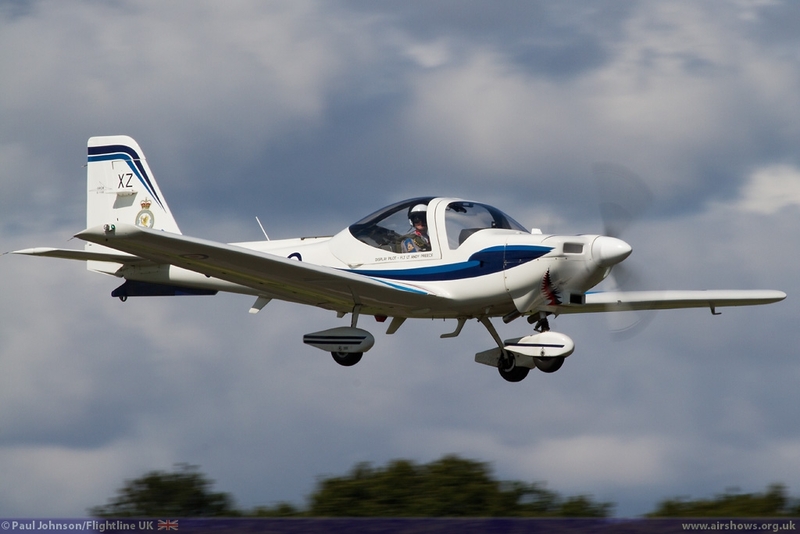 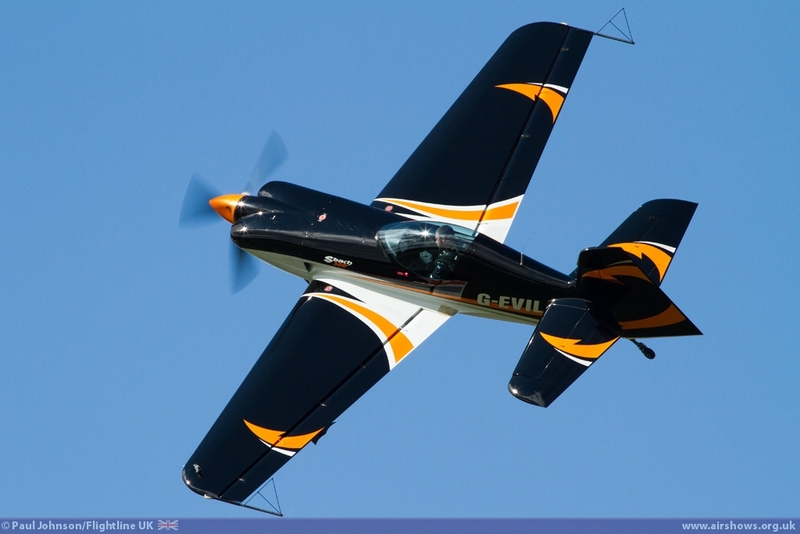 Solo aerobatics came from Edward Cyster flying an Xtreme Air XA41 and his display did not disappoint full of the gyroscopic tumbles, flicks and rolls that mark the XA41 out as a winner competition aircraft. 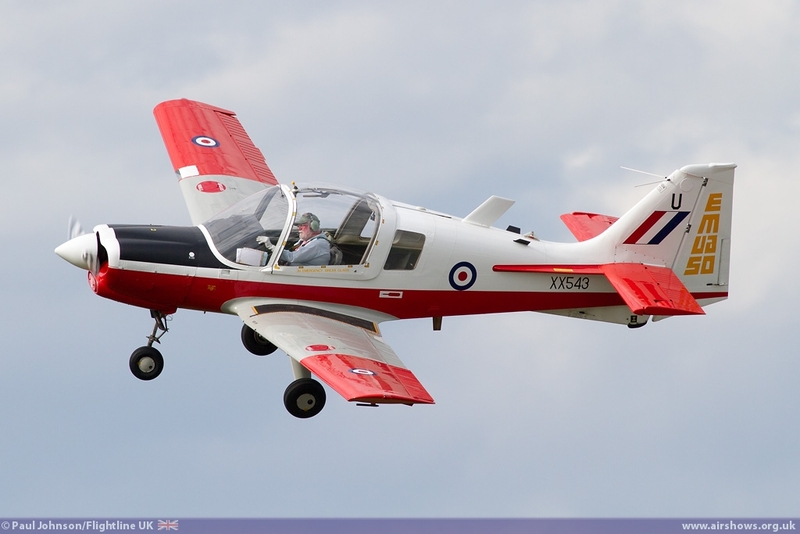 Rod Dean also gave a very fine display in the Scottish Aviation Bulldog with some lyrical aerobatics that took in the entire display line. 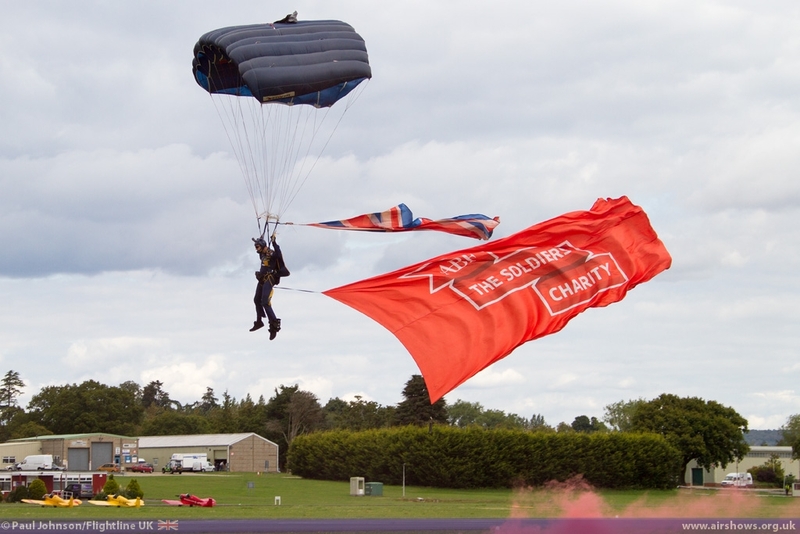 The modern day Royal Air Force also made a good contribution to the event. 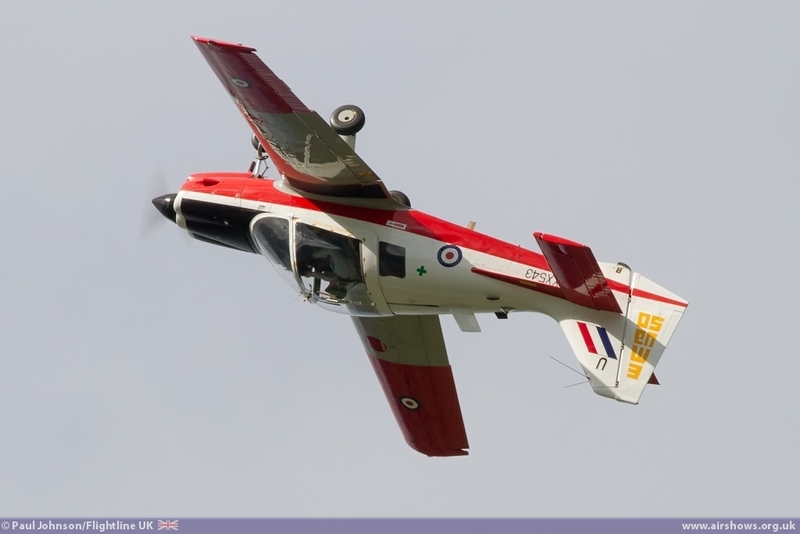 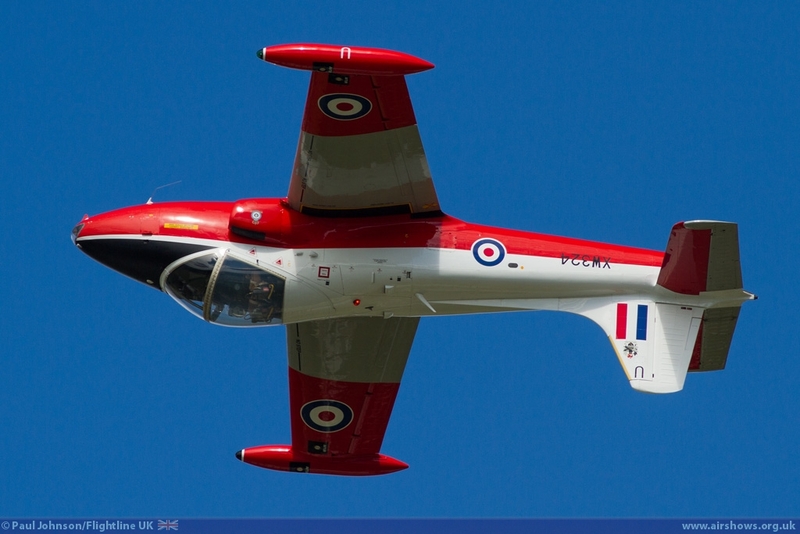 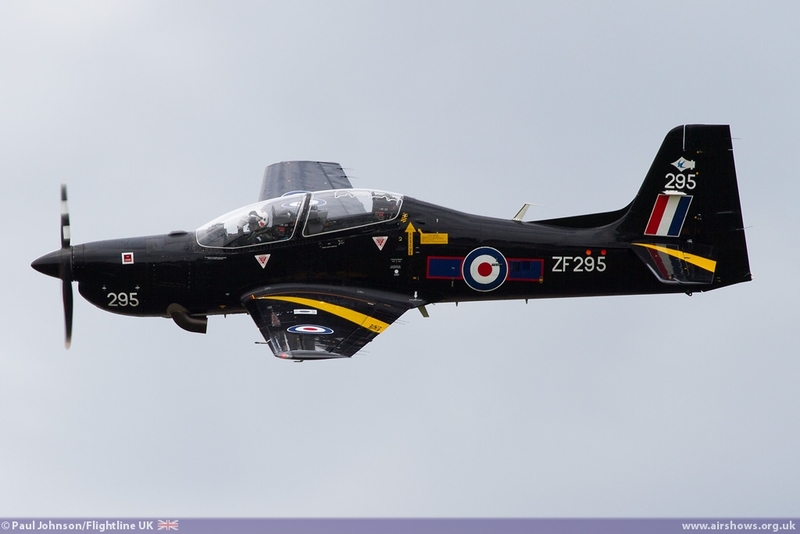 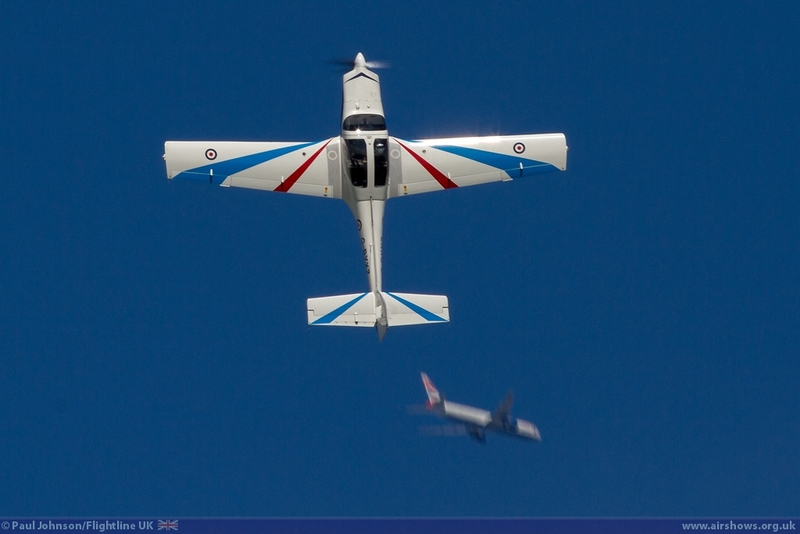 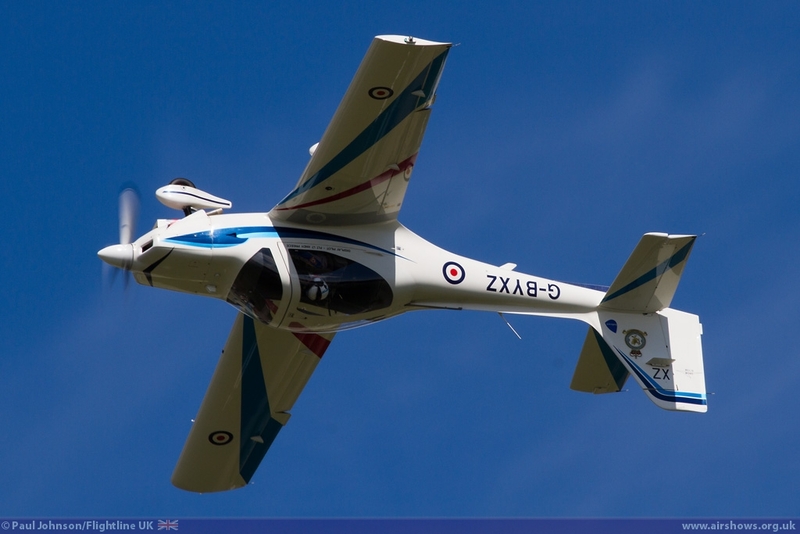 Solo displays came from Flt Lt Andy Preece on both days flying the Grob Tutor and on Sunday, Flt Lt Dave Kirby flying a standard 72[R] Squadron Shorts Tucano T1. 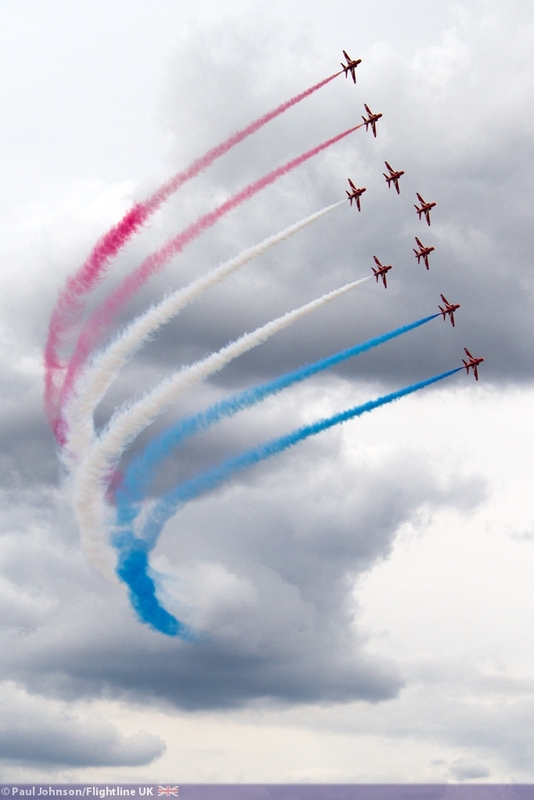 Also appearing on the Sunday only were the Red Arrows who were completing a busy weekend of displays that saw them displays in the far eastern and western corners of the UK. 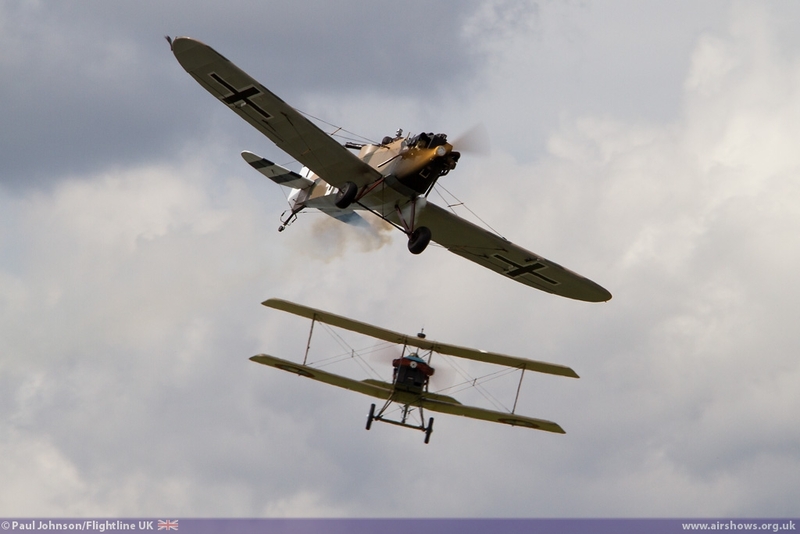 Stars of the modern military action were two rotary displays. 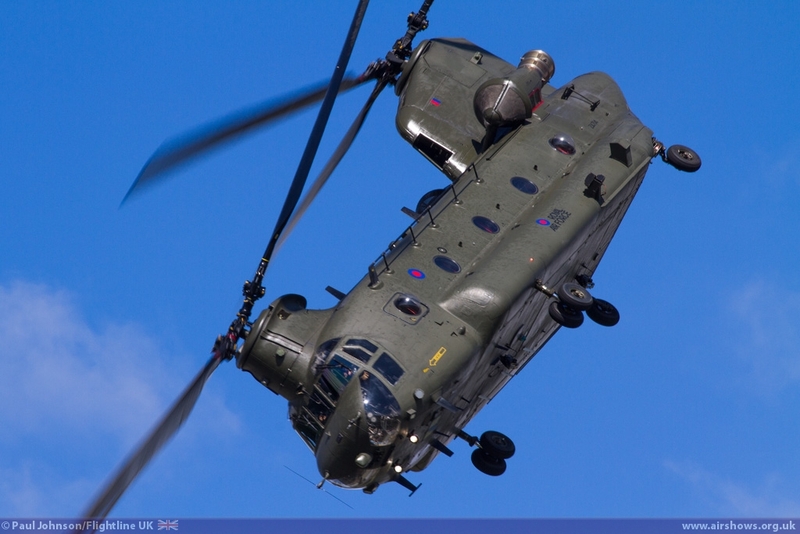 Dunsfold often shakes to the "blade-slap" of RAF Chinooks on training exercise and the Chinook Display Team often uses the airfield for display practice in the work-up period. 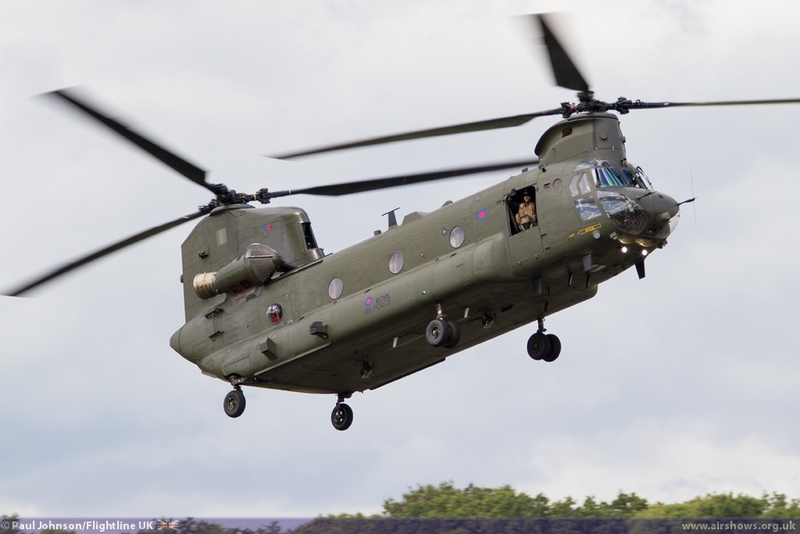 It was therefore good to see them back at the aerodrome giving their usual noisy and lively account of the heavy-lift helicopter. 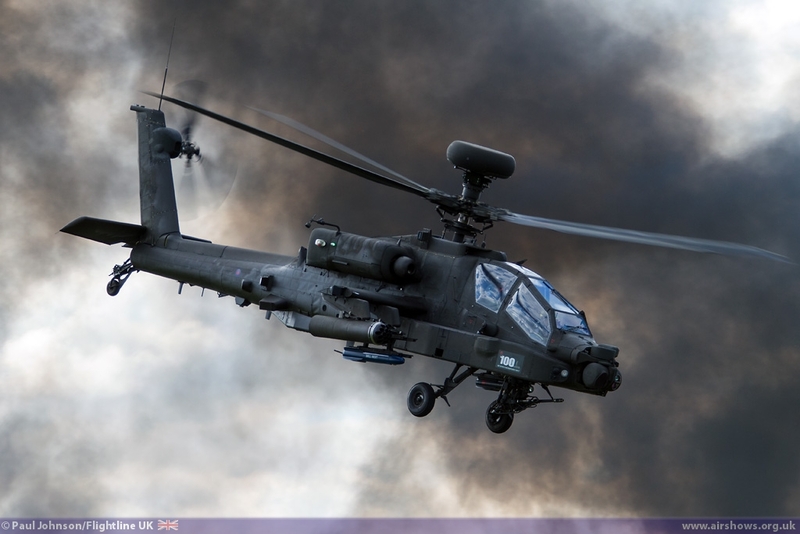 The Army Air Corps Apache AH1 was certainly a hard display to miss with some superb pyrotechnic support from Event Horizon. 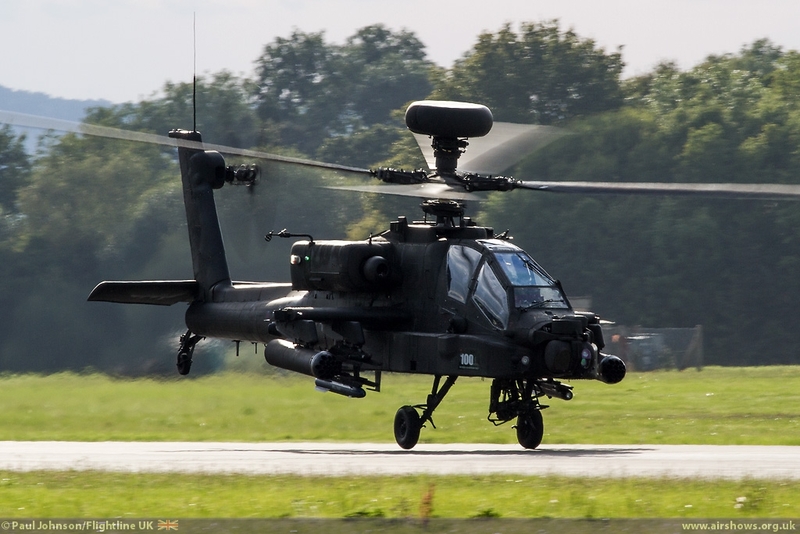 While the Apache routine is a display, it actually highlights many of the tactics used by Apaches in support of ground forces in Afghanistan while keeping the action right in front of the crowd with some very steep turns and nose-down manoeuvres. 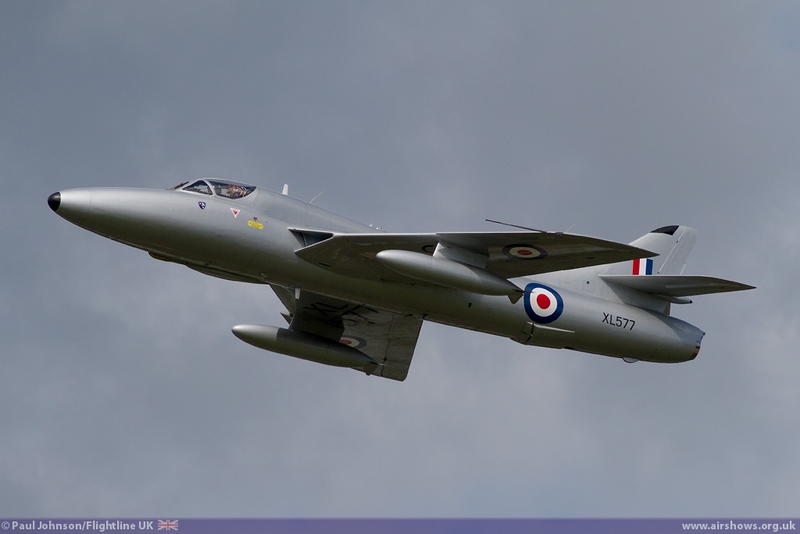 Classic jets, and in particular the Hawker Hunter are always an important part of Wings and Wheels. 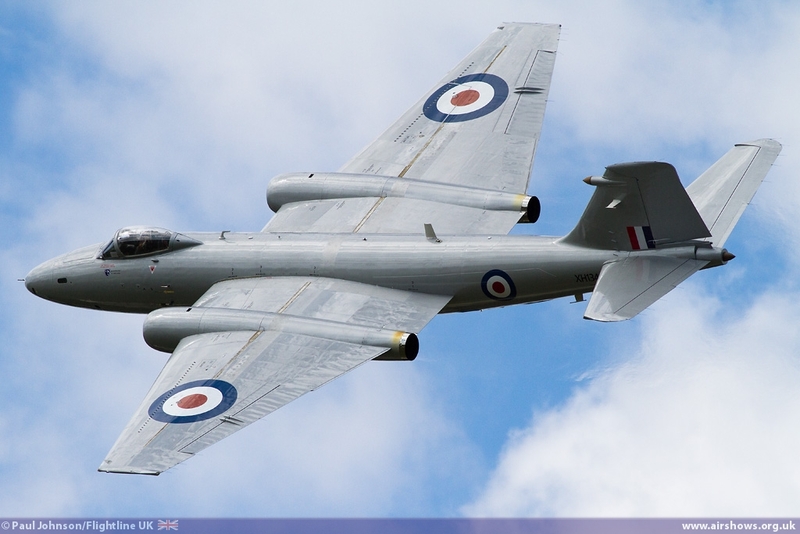 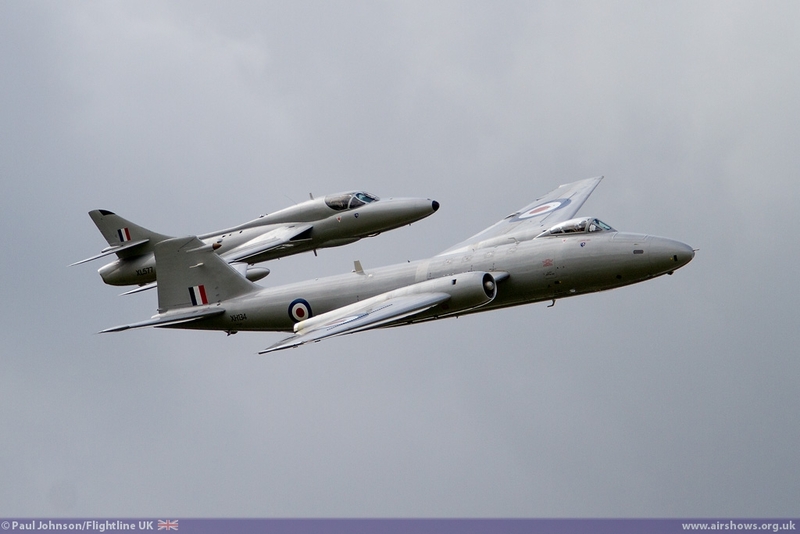 This year, it was the turn of the Midair Squadron to display one of the types most associated with Dunsfold's history alongside their lovely BAC Canberra PR9 over both days of the show. 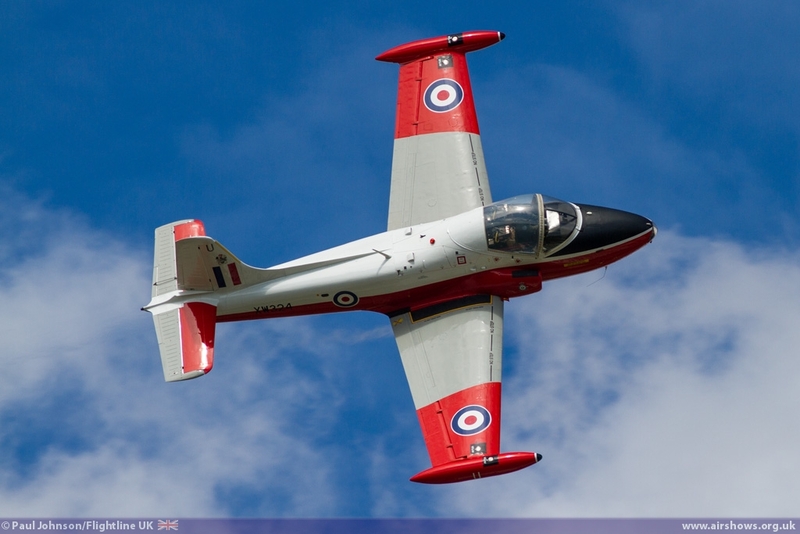 Dan Arlett return Dunsfold with Jeff Bell's BAC Jet Provost T5 to give a lovely full aerobatic performance under blue skies on both days. 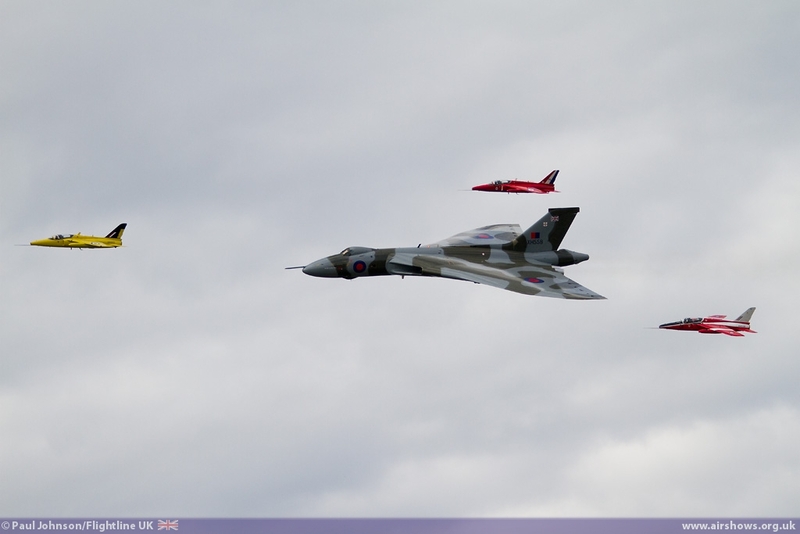 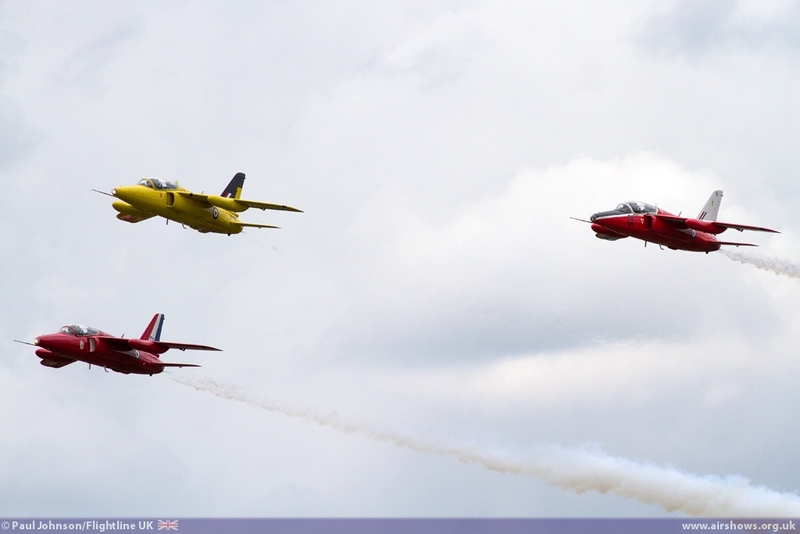 The Avro Vulcan XH558 also flew on both days of the show but the highlight of its appearance was another special formation with the three Folland Gnat T1s of the Gnat Display Team which took place on the Saturday of the event. 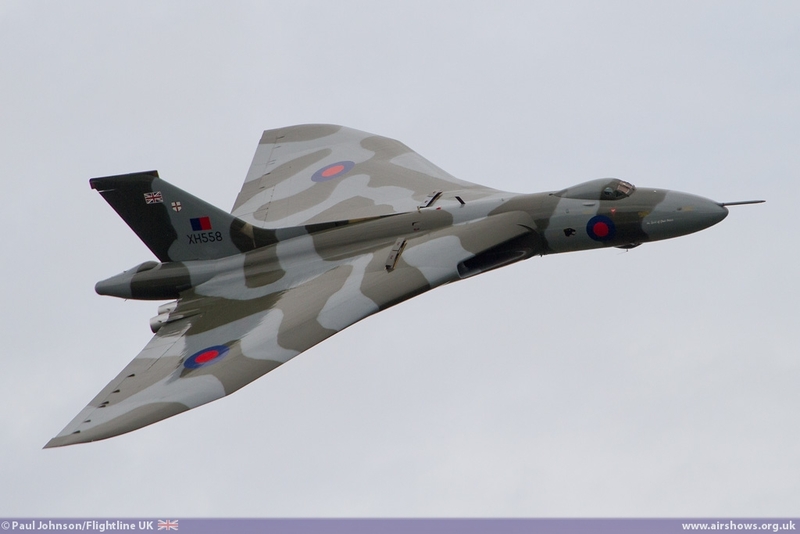 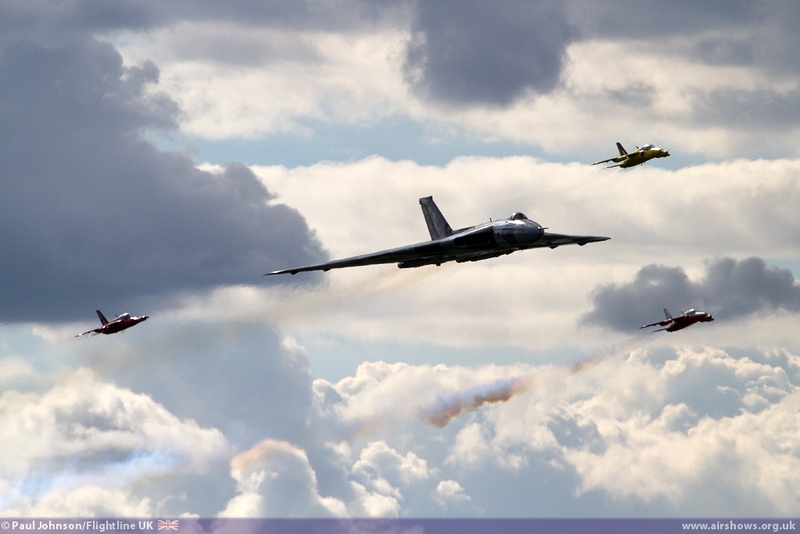 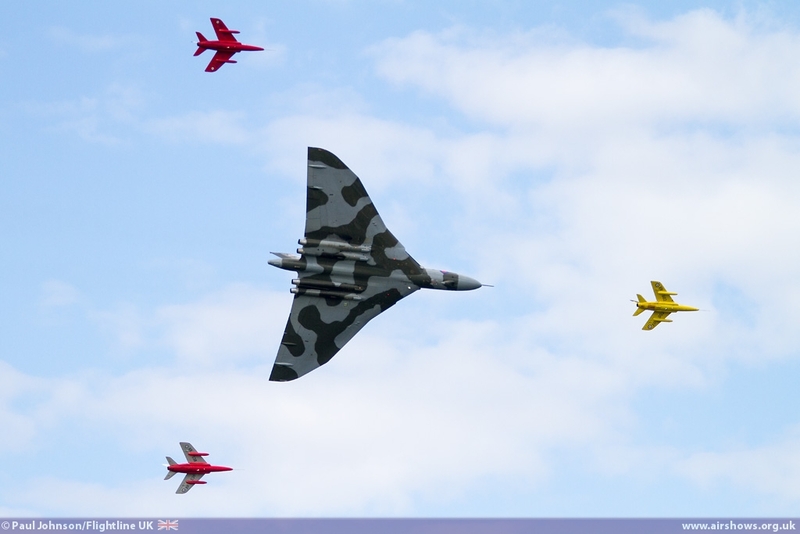 Of all the mixed Formations the Vulcan has done, this was one of the very best with the Gnats surrounding the Vulcan. 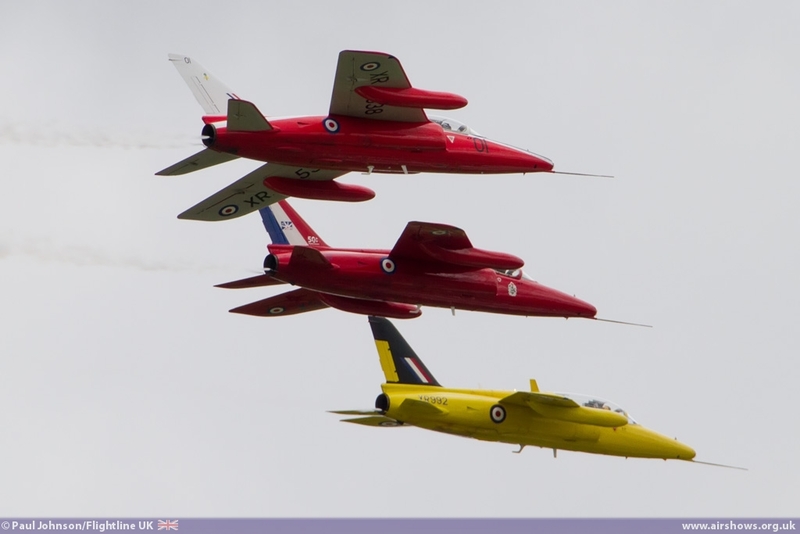 The view back from the lead Gnat flown by Chris Heames must have been extraordinary! 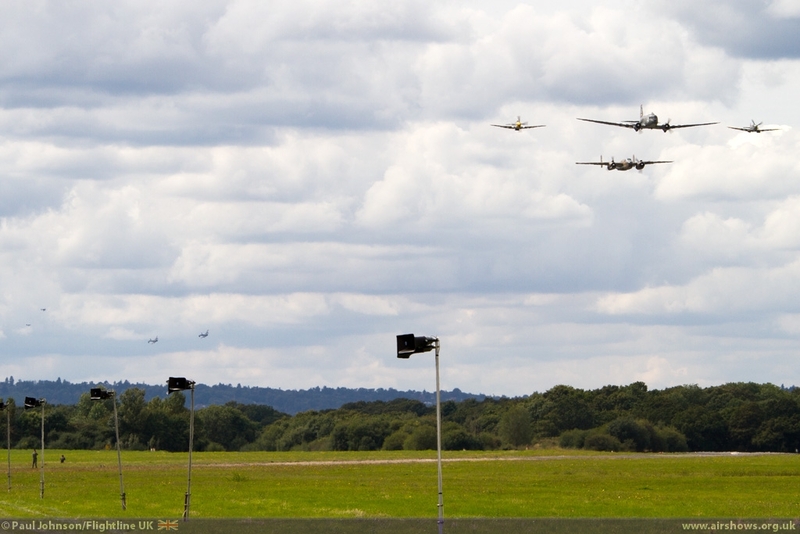 In the past ten years Dunsfold has developed its own special atmosphere. Of all the airshows during the year, Wings and Wheels is always the most entertaining and that really should be what airshows are all about. 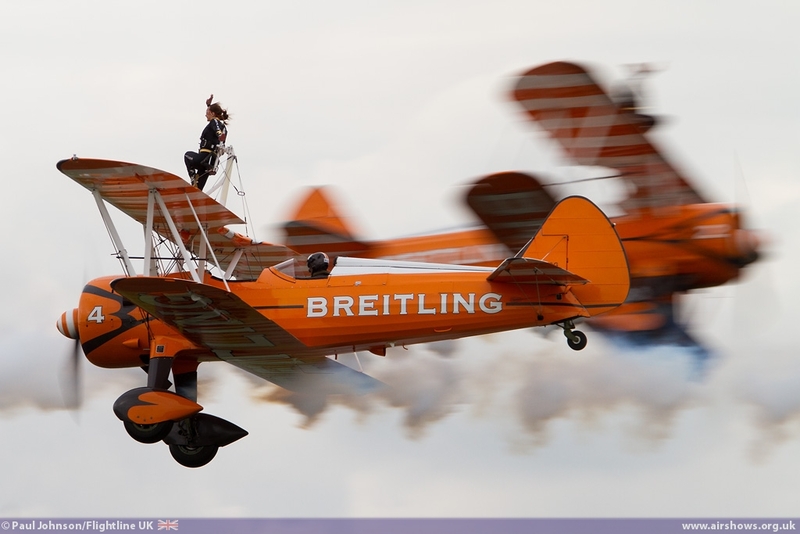 That certainly seems to be the ethos of the aviation commentary team of Melvyn Hiscock and Brendan O'Brien who seen to be having as much fun (if not more) as the rest of us!!! 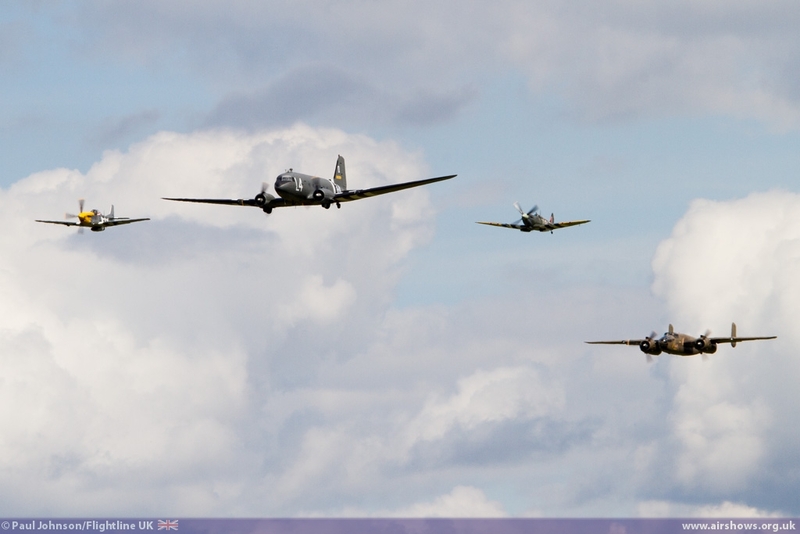 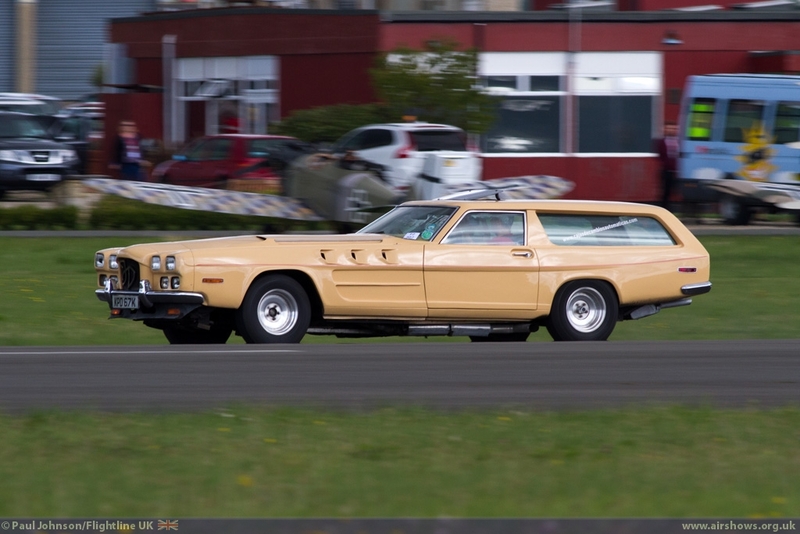 Long may Dunsfold Wings and Wheels continue as it really is one of the highlights of the season in so many ways.